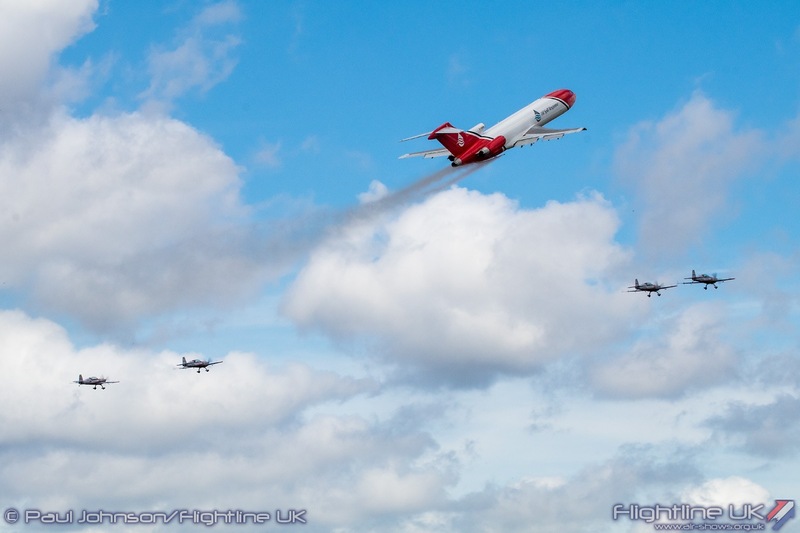 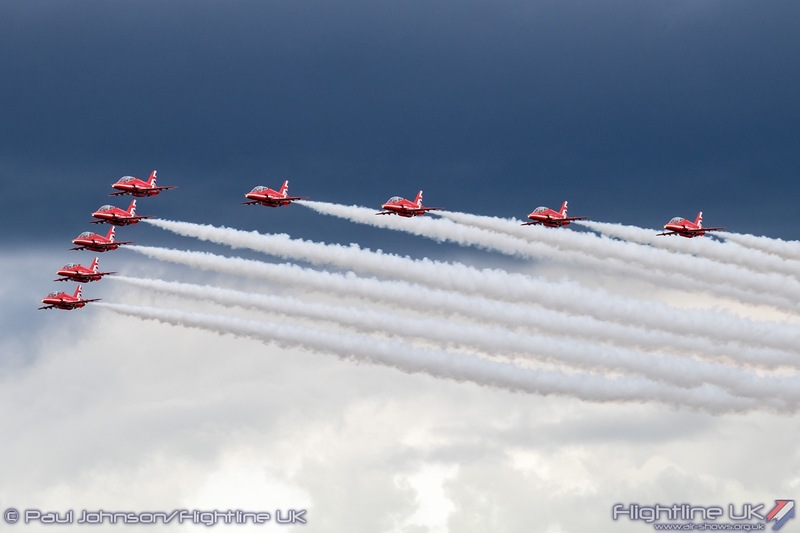 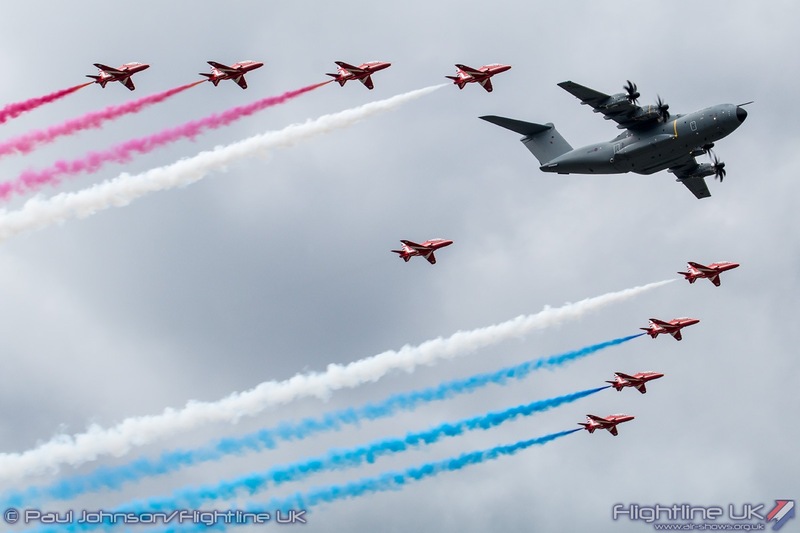 At the weekend, the Farnborough International Airshow changes into a much larger public event. 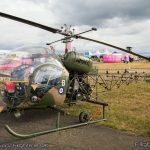 The business atmosphere which can be quite calm is changed by the hustle and bustle of thousands of visitors crowding the show site. 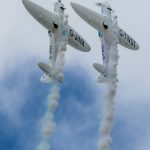 The show changes tack too from acting as a catalyst for business to promoting aviation to an entirely new audience. 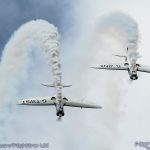 The change from Trade Show to Family Day out starts mid-way through the Trade week as many of the flying and static display participants start to arrive. 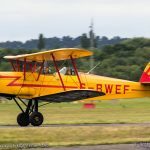 Saturday sees Farnborough reborn in to the Public Day event which has different branding and takes over even more of the airfield. 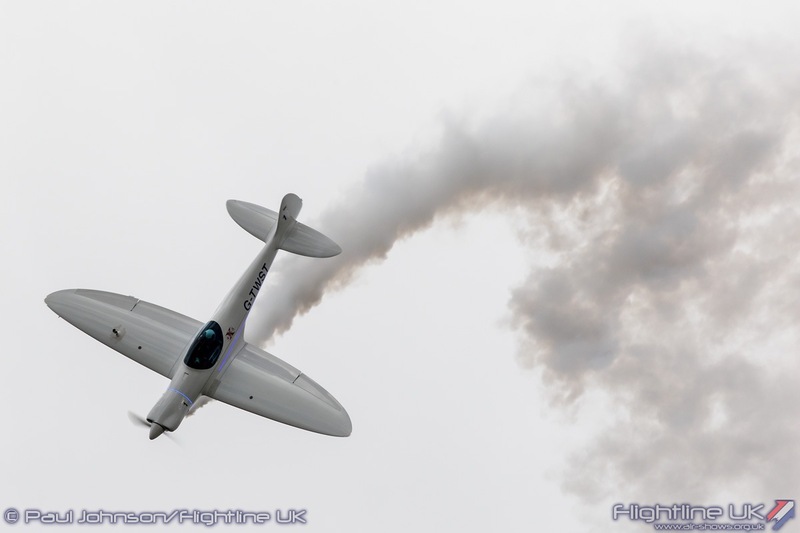 As the Exhibition Halls close, so the showground expands out towards Laffan’s Plain. 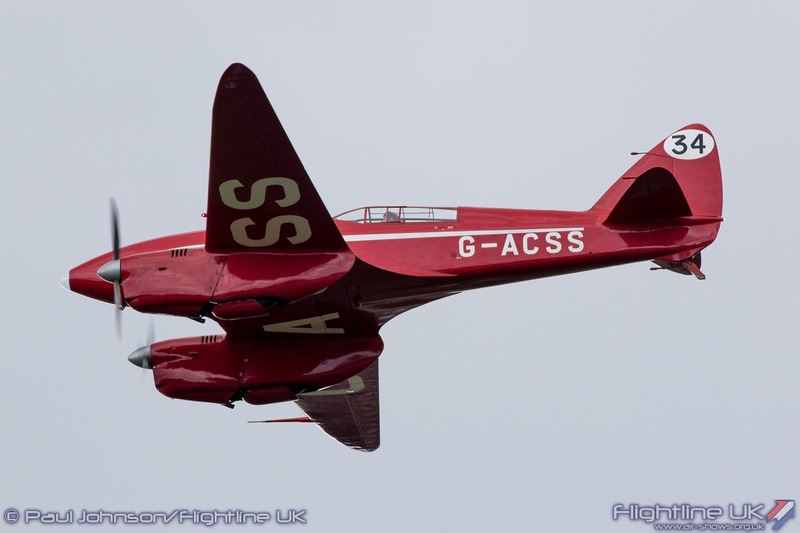 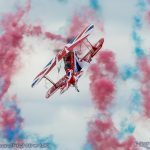 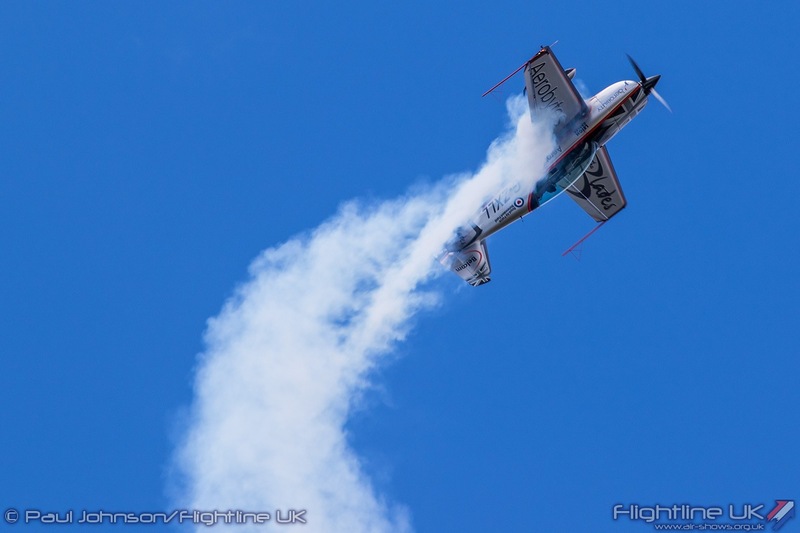 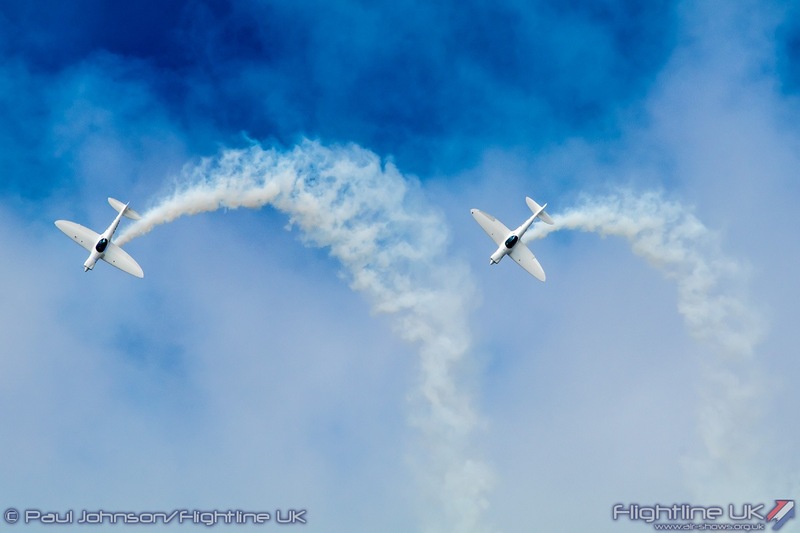 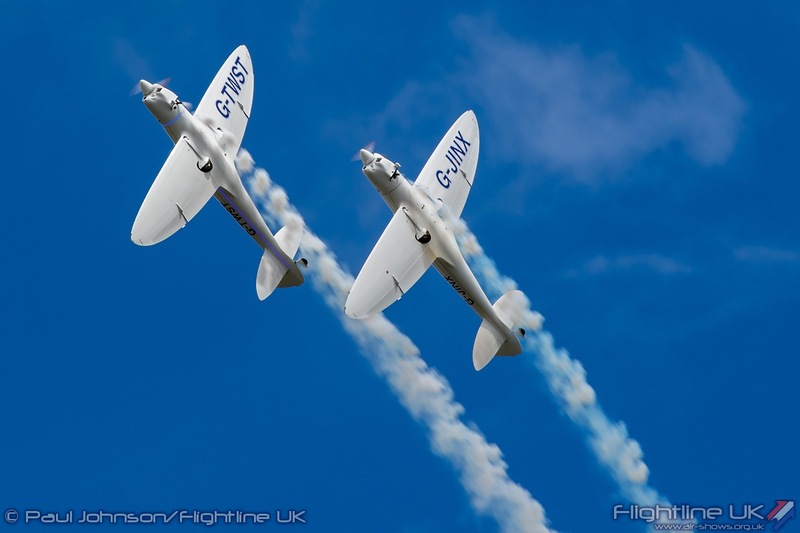 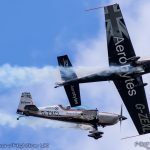 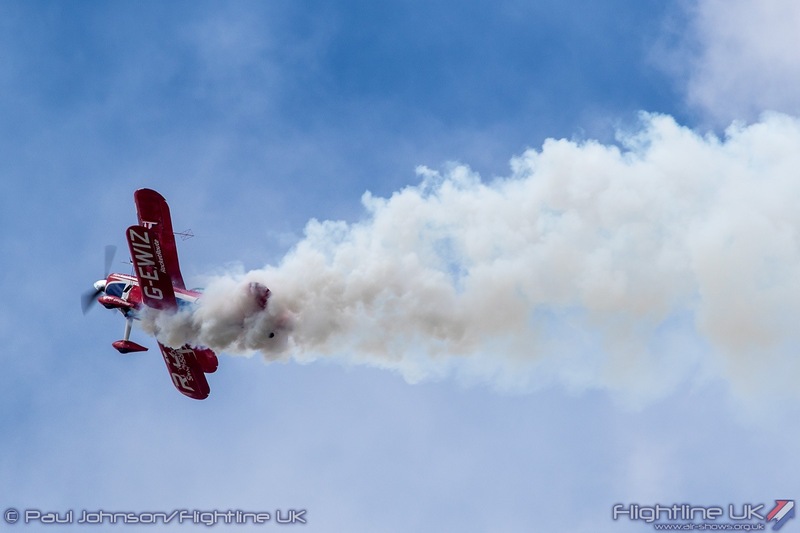 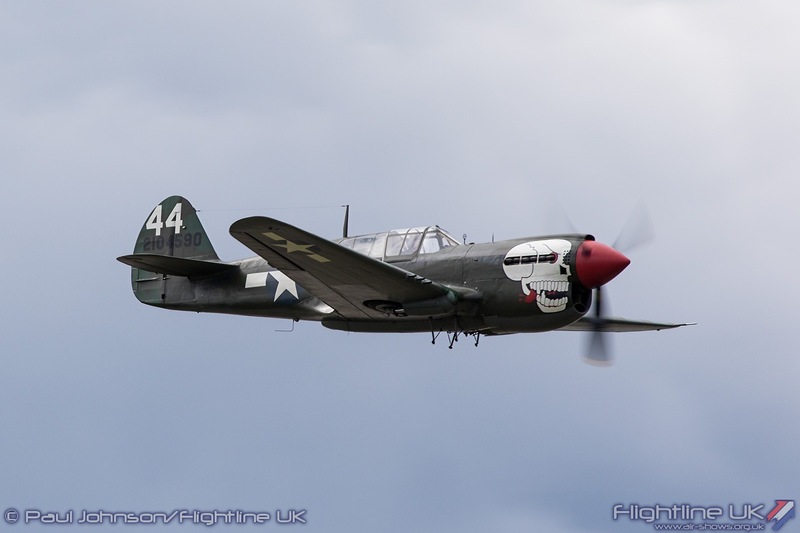 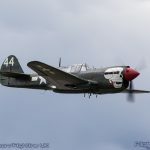 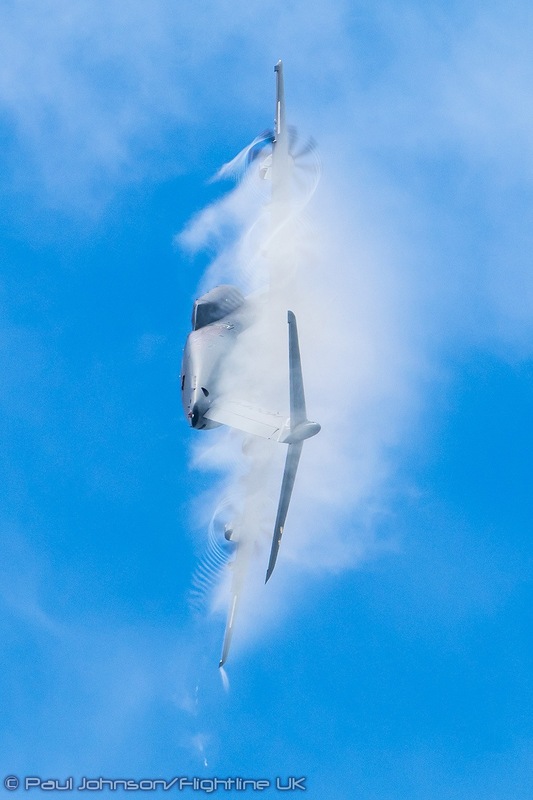 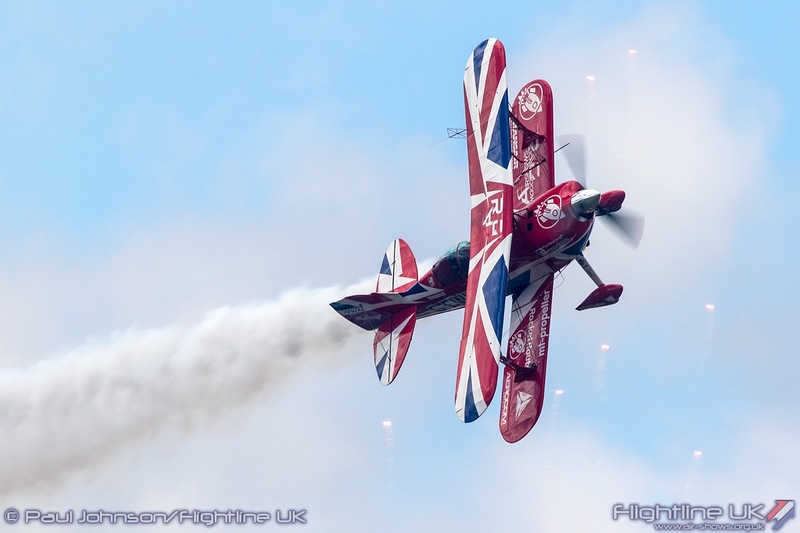 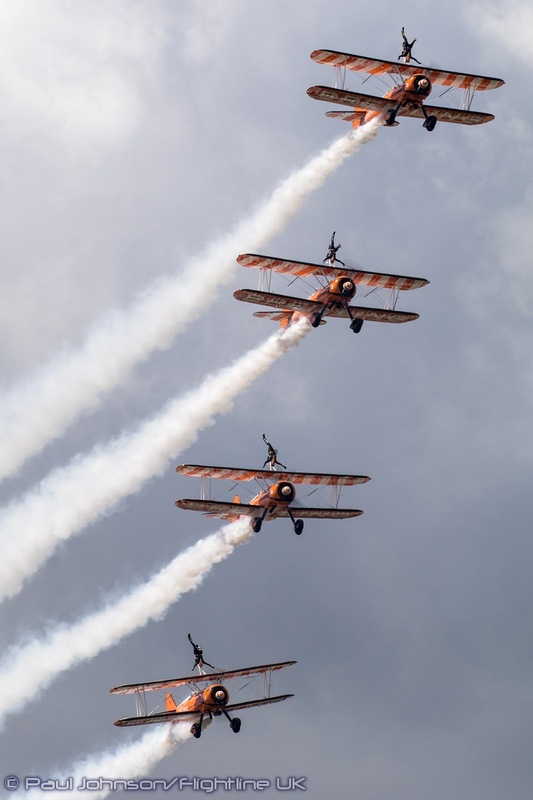 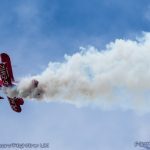 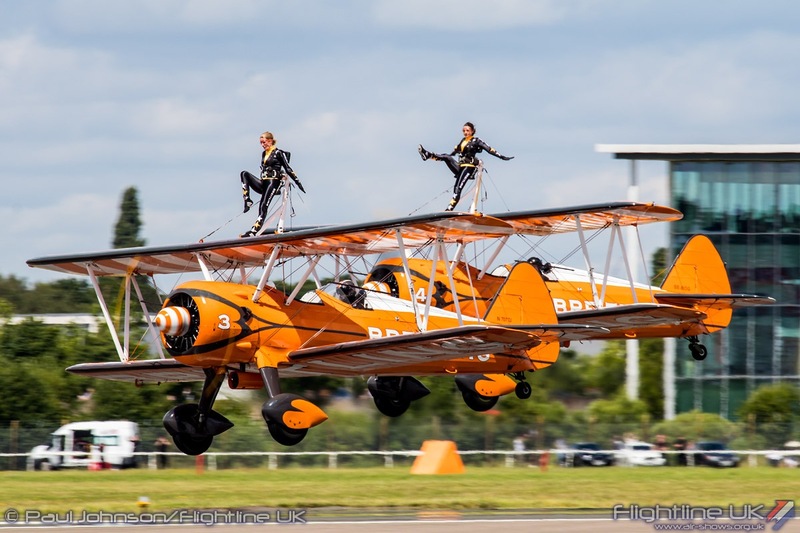 The action during the public days lasts throughout the day with a stage show dubbed “Airshow Live” hosted by Angelica Bell and Michael Underwood. 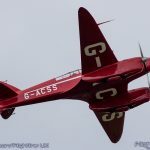 This sees guest interviews, competitions, and special feature programmes played out across the showground on the big screens promoting Aviation, Science, Technology and Mathematics. 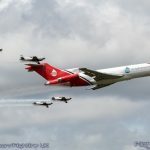 Boosting the STEM element of the show was the UK’s first official astronaut, Major Tim Peake, who officially opened the event from the Airshow Live Stage. 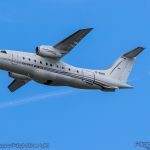 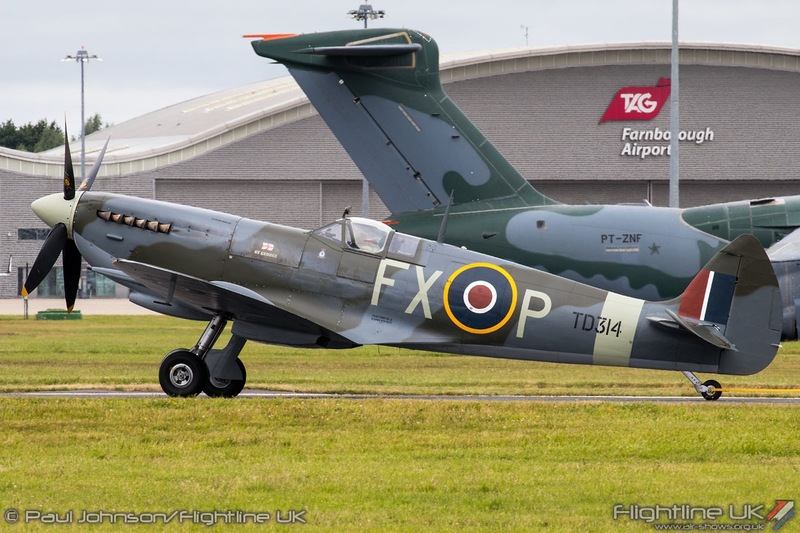 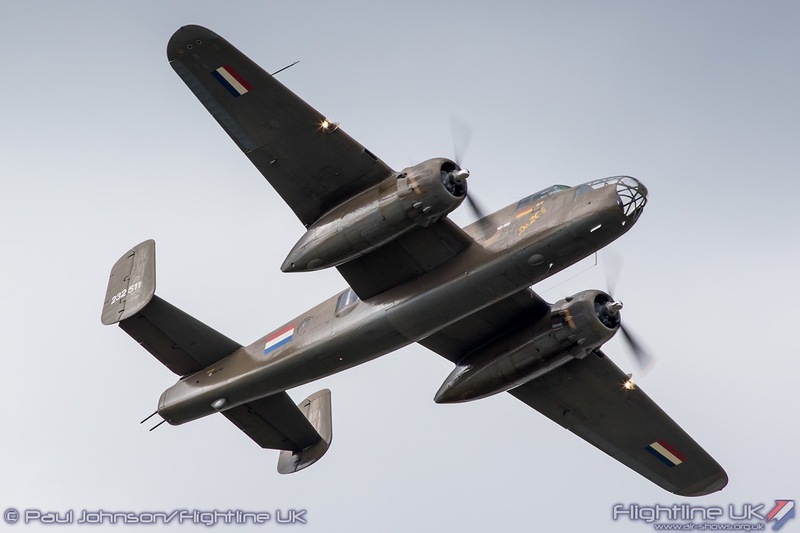 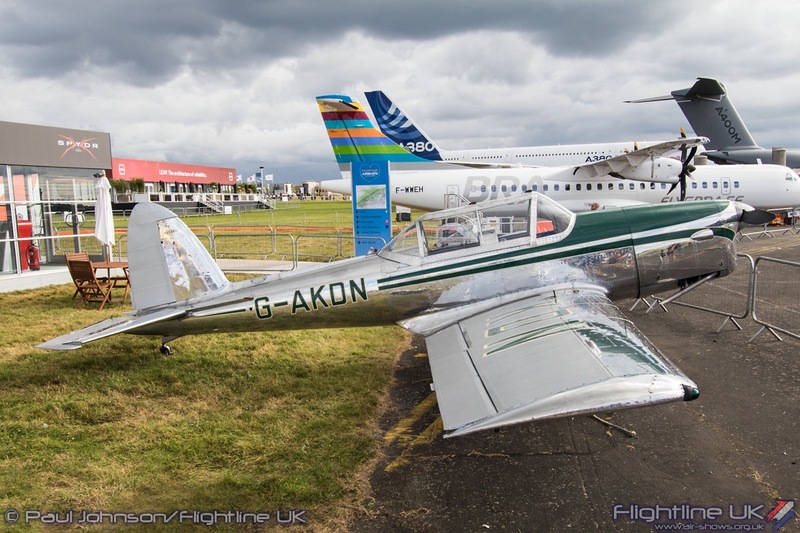 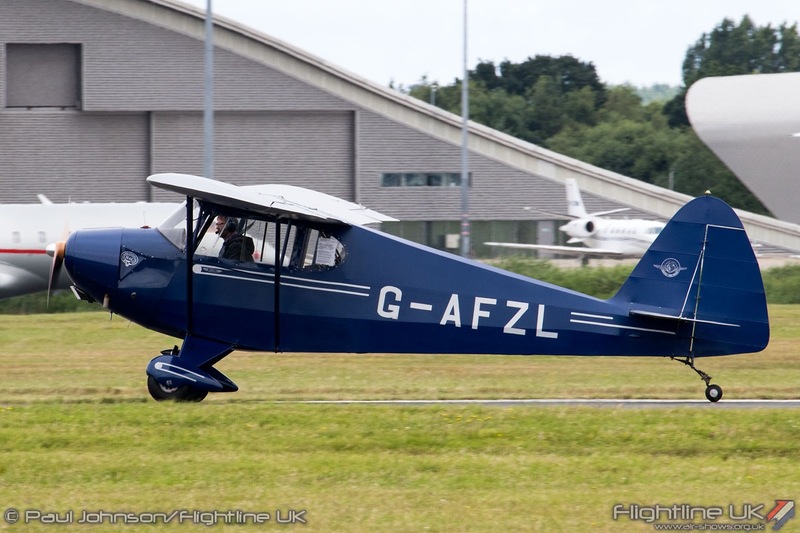 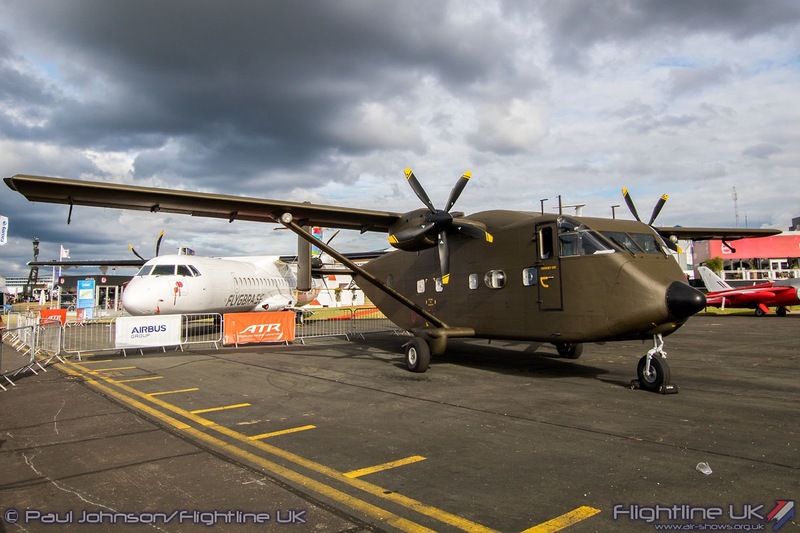 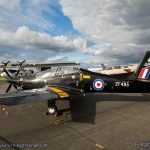 The static aircraft displays change too as some of the aircraft exhibited during the trade week head home from the Wednesday onwards. 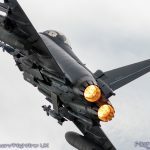 This is not because they are unwelcome at the weekend, but because many of them are required for testing or commercial programmes. 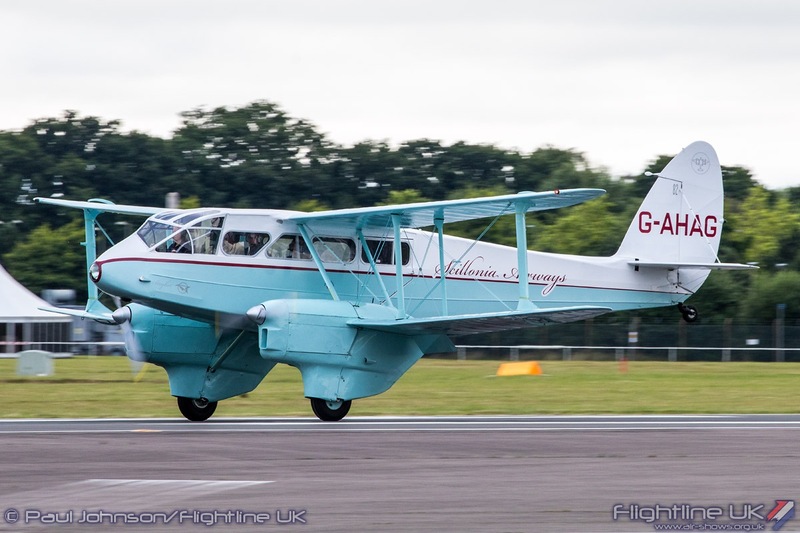 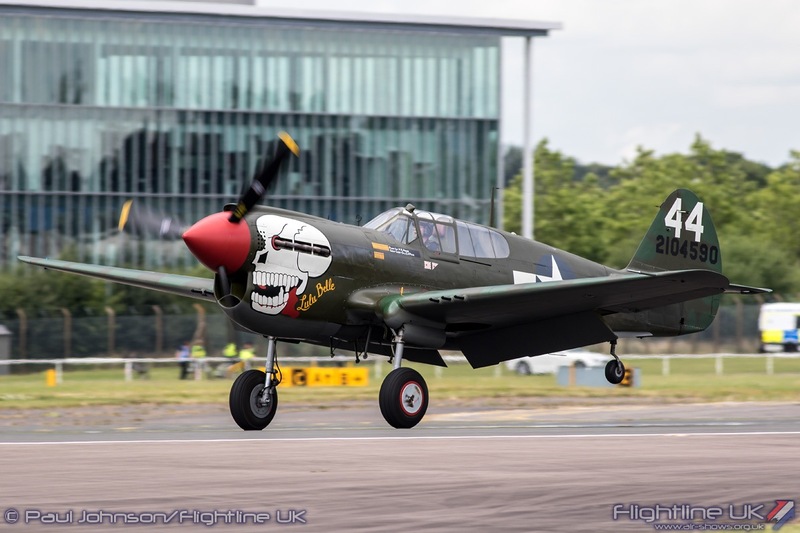 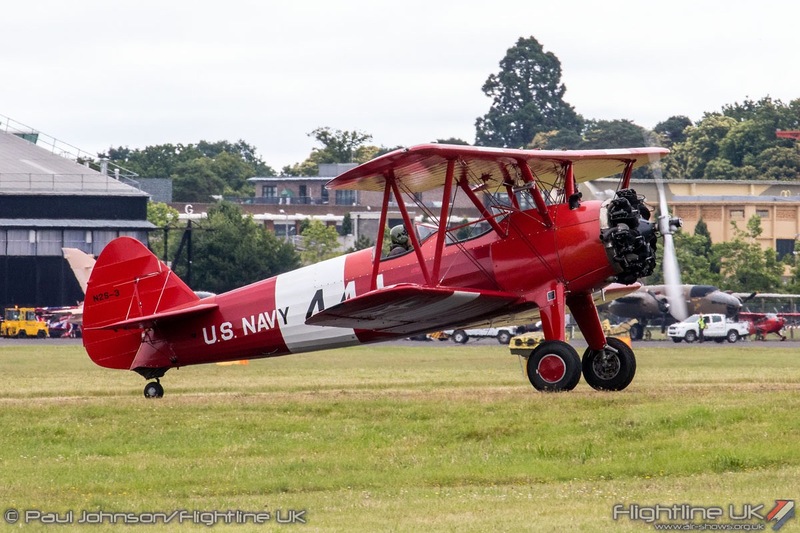 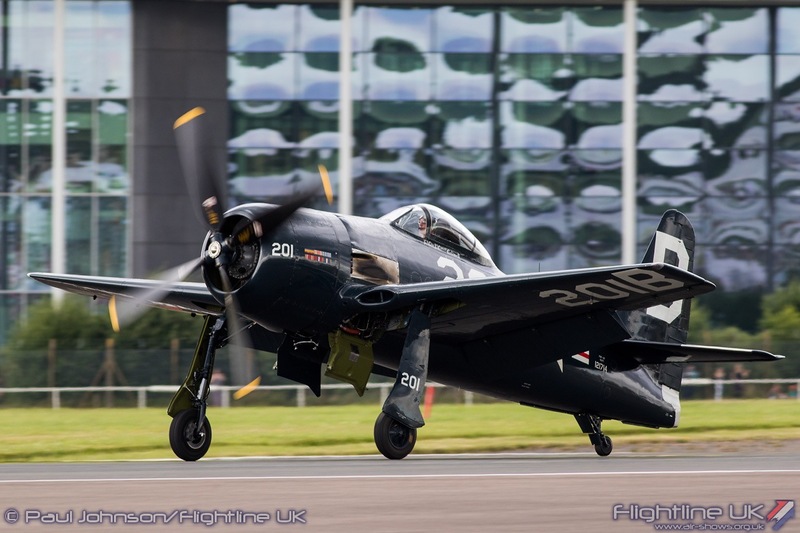 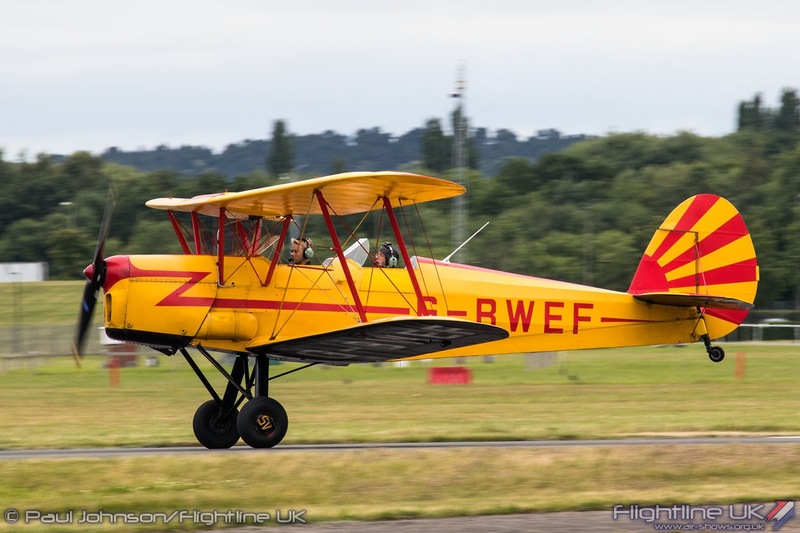 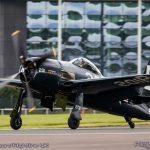 In their place, Farnborough brings together all manner of types covering aviation history from vintage biplanes to warbirds to classic jets. 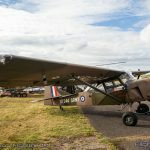 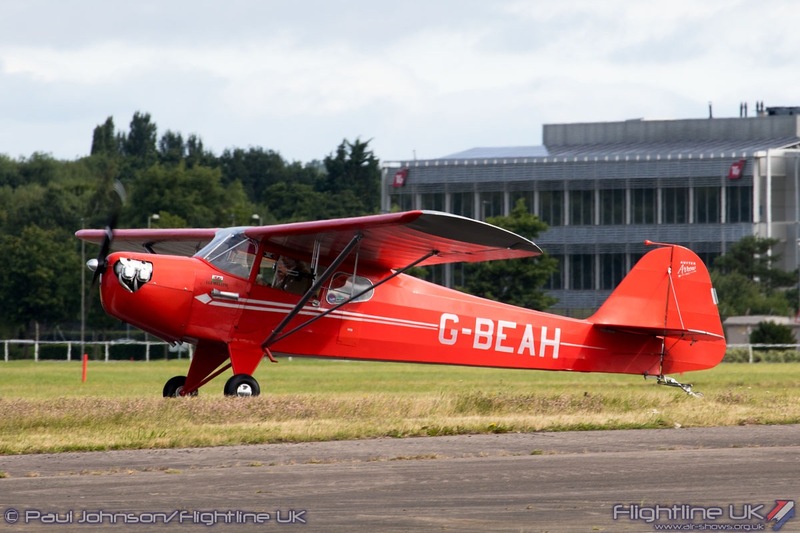 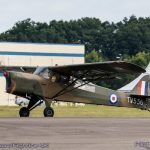 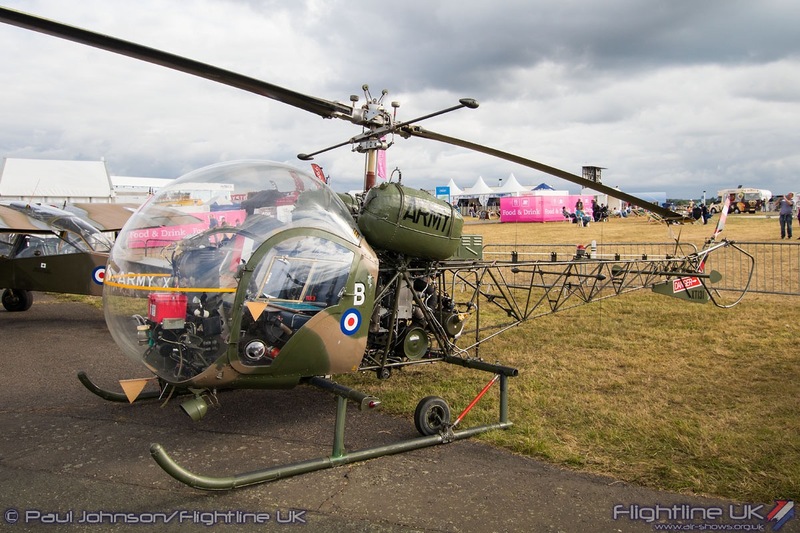 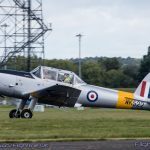 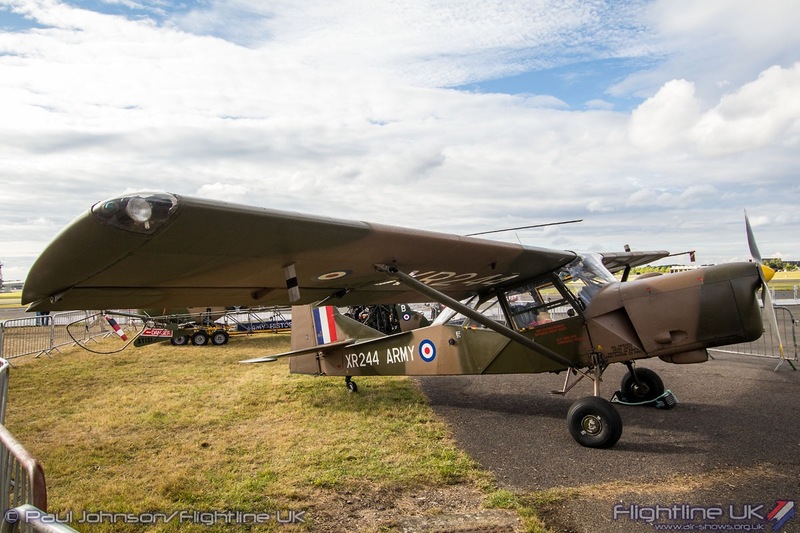 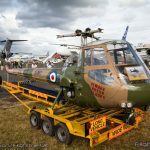 Amongst the historic highlights were the first production de Havilland Canada DHC-1 Chipmunk G-AKDN visiting from Canada, the Army Historic Aircraft Flight with Agusta/Bell Sioux AH1, SARO Skeeter and Westland Scout. 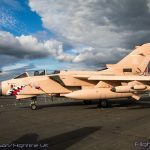 The modern day Royal Air Force also made a contribution with a Shorts Tucano T1 from 72[R] Squadron and a very rare airshow appearance by the Panavia Tornado GR4 painted in Desert Pink celebrating 25 years of frontline operations for the type. 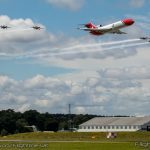 The biggest headline though from the public perspective was changes to Farnborough’s flying display area and regulations. 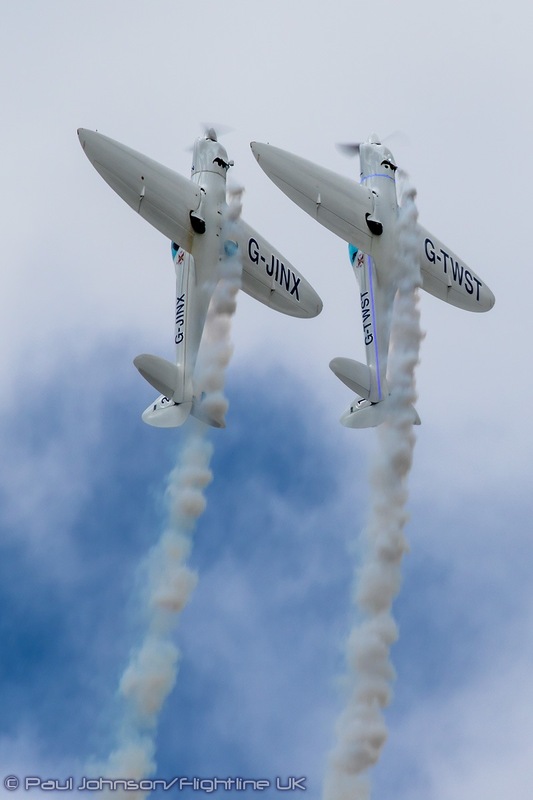 Every air display in the UK is subjected to enhanced risk assessments which were introduced in late August 2015. 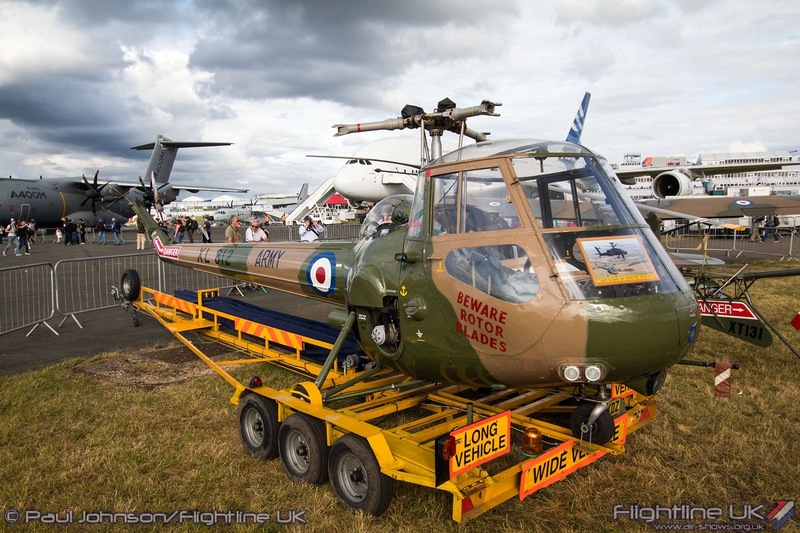 These include a much stronger emphasis on the local area surrounding display sites. 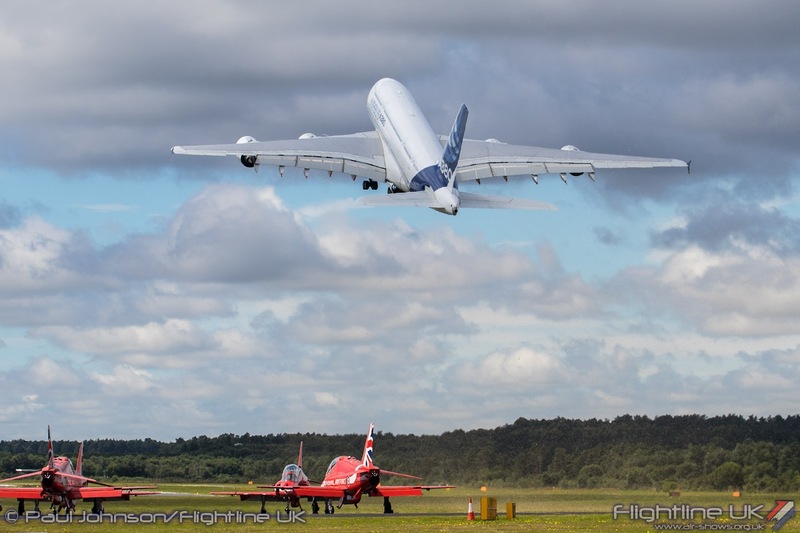 Farnborough has witnessed substantial change in the last few years as built up areas around the airfield have expanded. 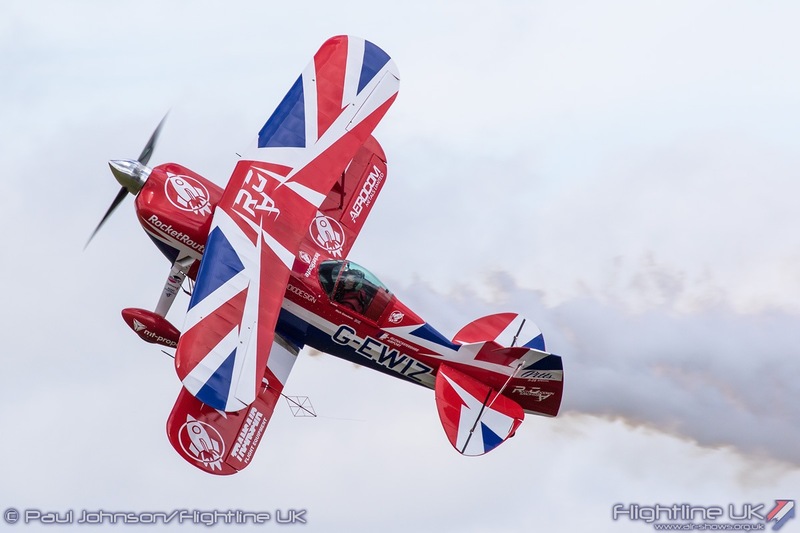 This has led to the display centre being moved slightly to the west of its pre-2014 position and much tougher rules over display altitudes and aerobatics outside the airfield boundary. 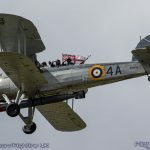 This did affect the way a number of aircraft were displayed and on occasion proved frustrating for the crowds as acts used a variety of “display centres” throughout the day to suit their routines and many were not able to use the full length of the crowd line. 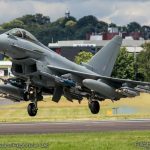 Adding to the frustrations over display restrictions were the withdrawal of the RAF Typhoon solo display and the Red Arrows from full displays. 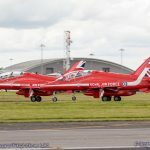 Every year, display sites and the surrounding areas are surveyed and risk assessed by representatives from the Royal Air Force and the Red Arrows. 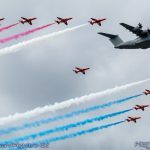 This year, particularly with sensitivities following the Shoreham tragedy last year, the RAF judged the risks too high to continue full displays at Farnborough. 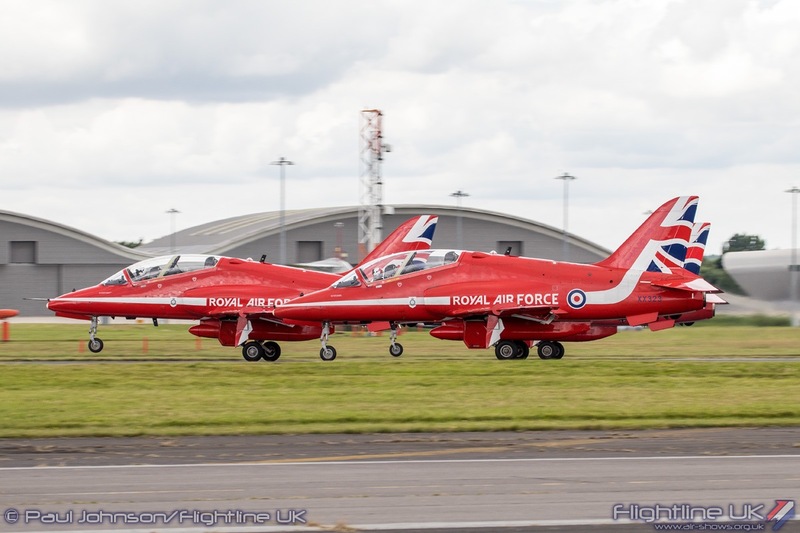 However, the Reds did attend from Friday through to Sunday with a more prominent parking position within the public areas. 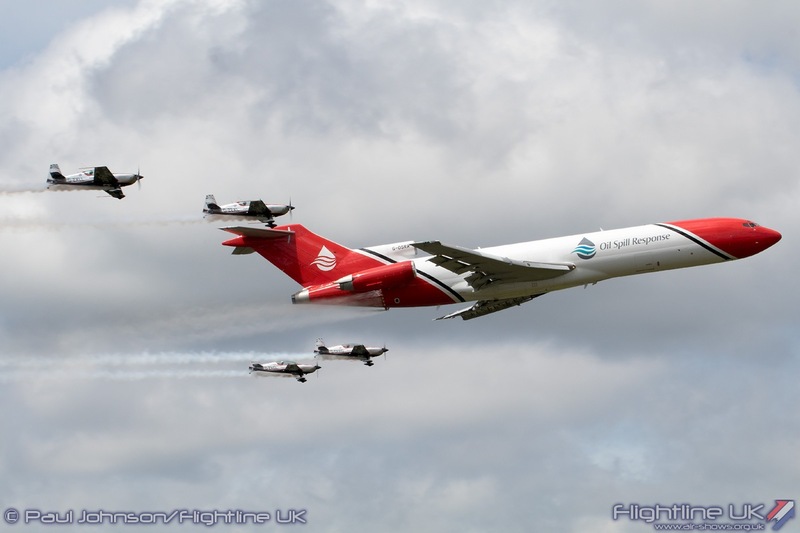 Each day they performed flypasts with other aircraft types. 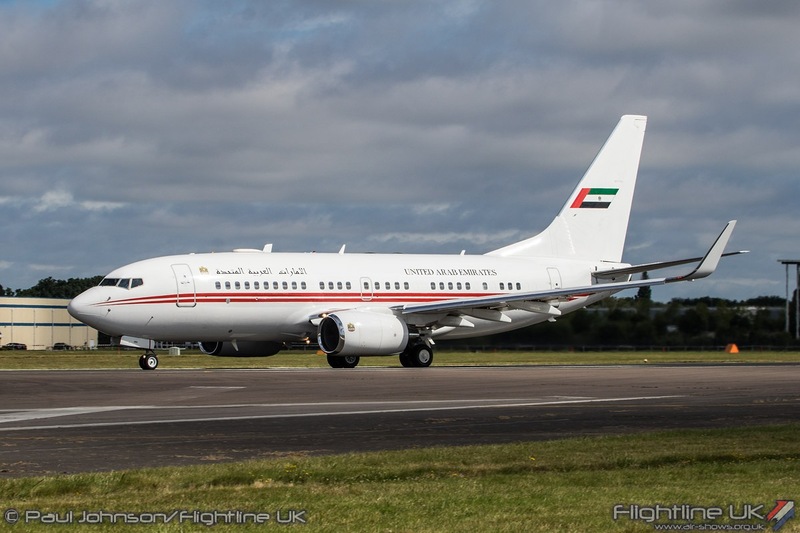 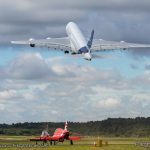 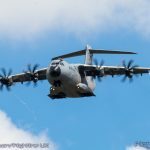 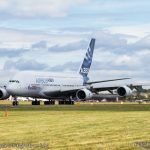 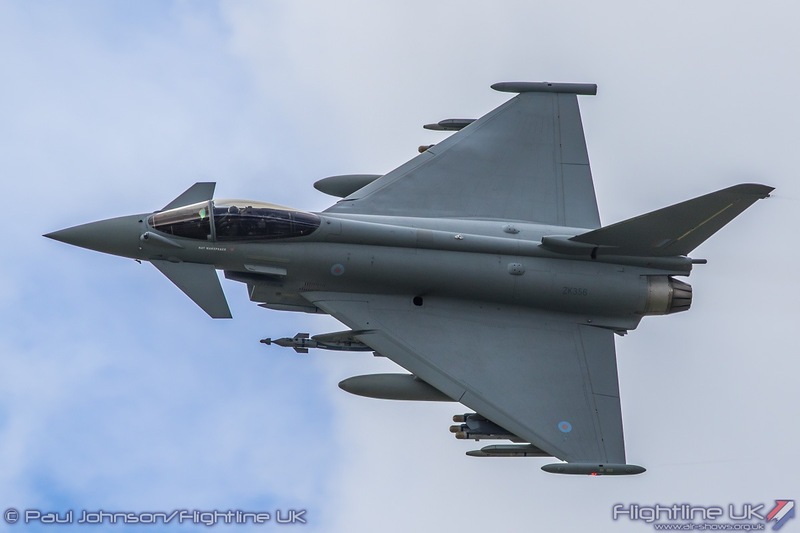 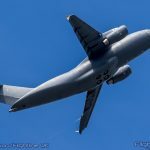 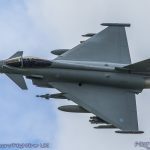 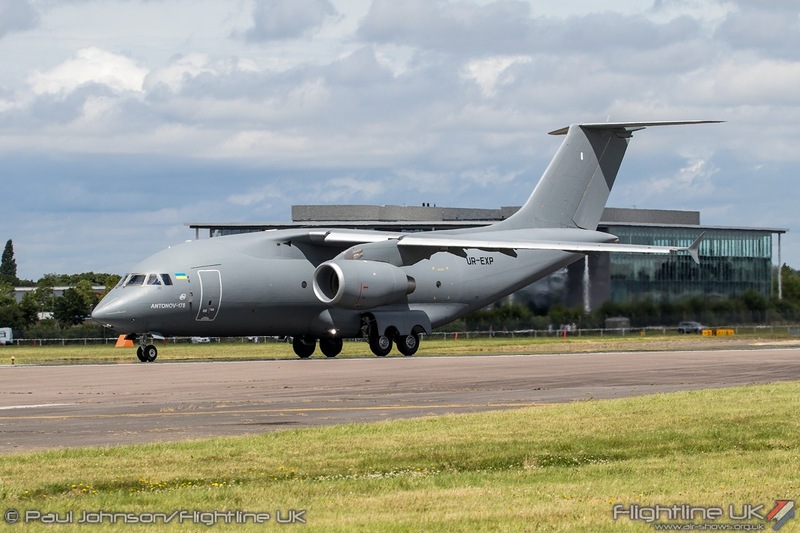 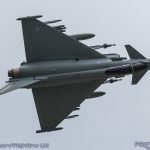 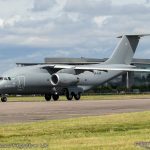 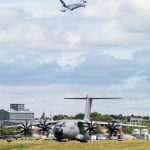 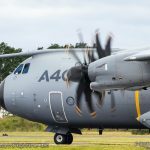 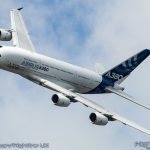 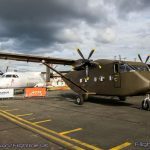 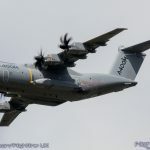 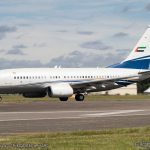 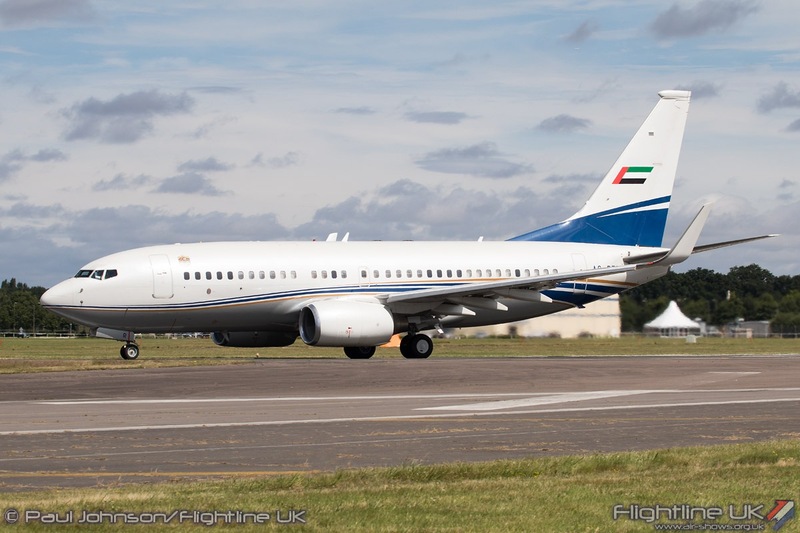 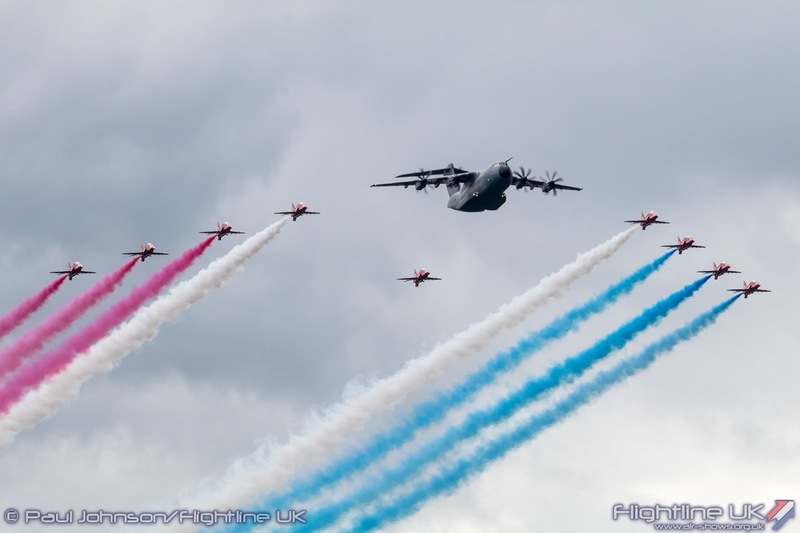 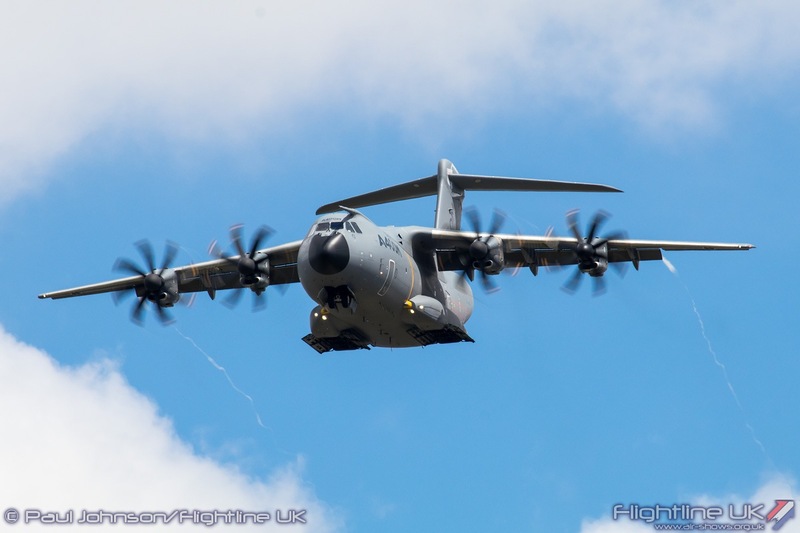 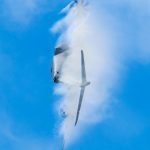 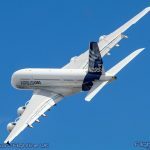 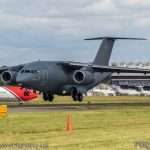 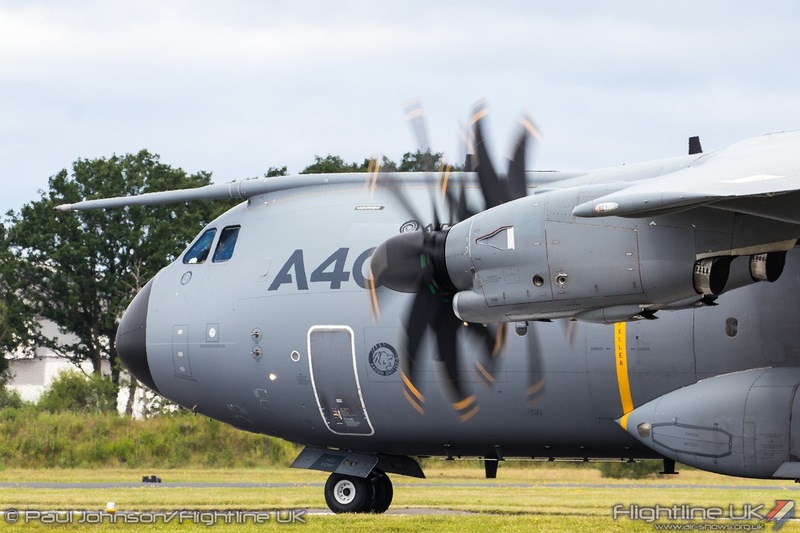 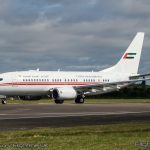 It was the turn of the Airbus A350-900 on the Friday while both Saturday and Sunday saw the Royal Air Force show off an Airbus A400M Atlas C1 from 70 Squadron. 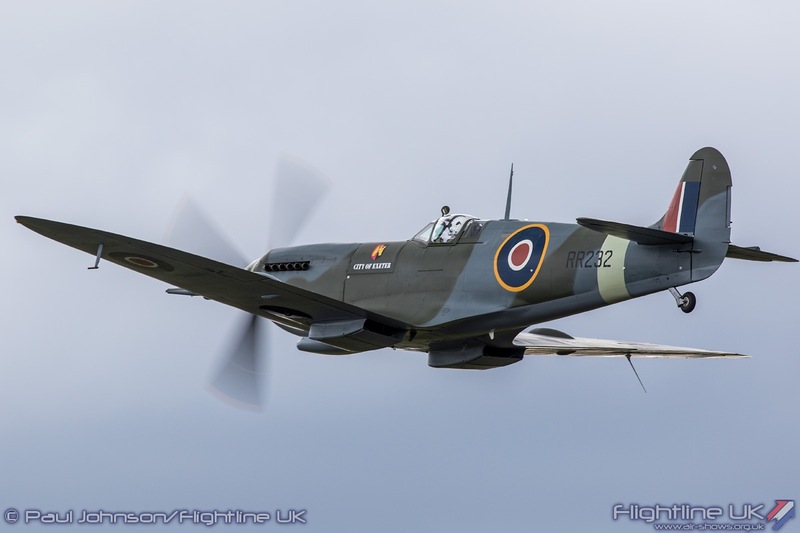 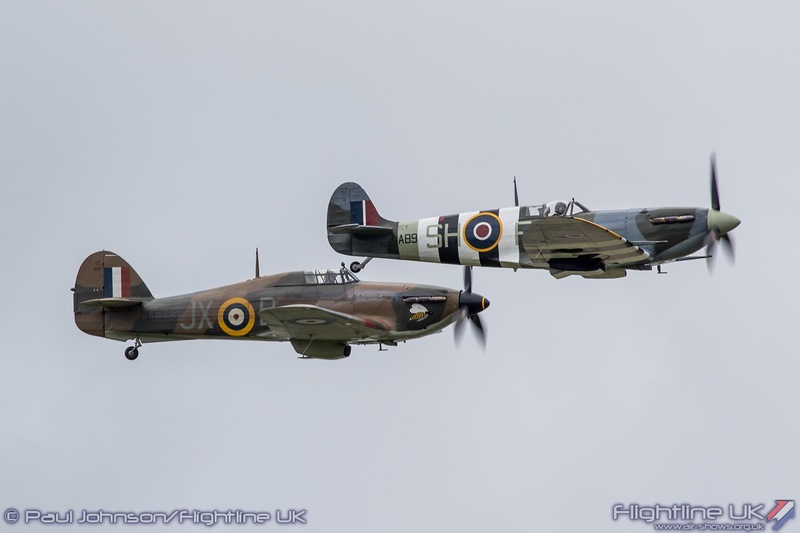 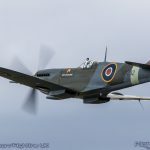 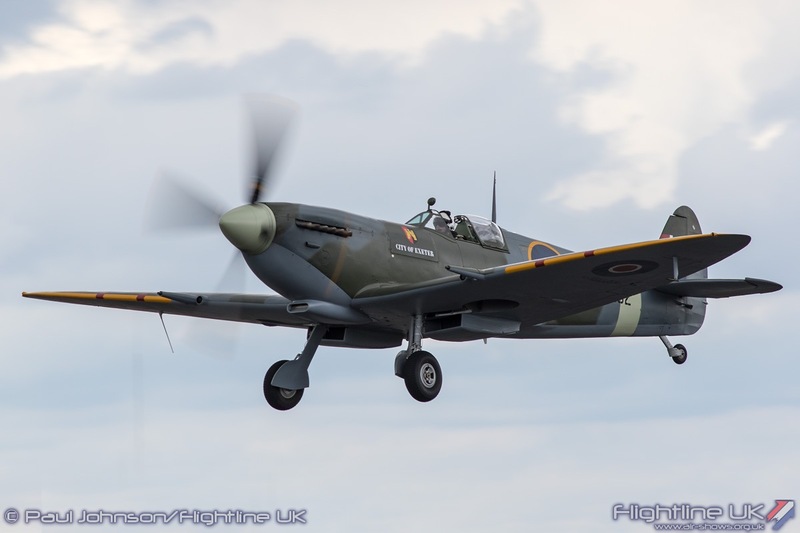 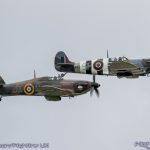 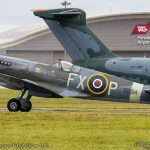 Completing the Royal Air Force contribution to the flying display were single flypasts on Saturday and Sunday by the Battle of Britain Memorial Flight Supermarine Spitfire Vb and Hawker Hurricane IIc. 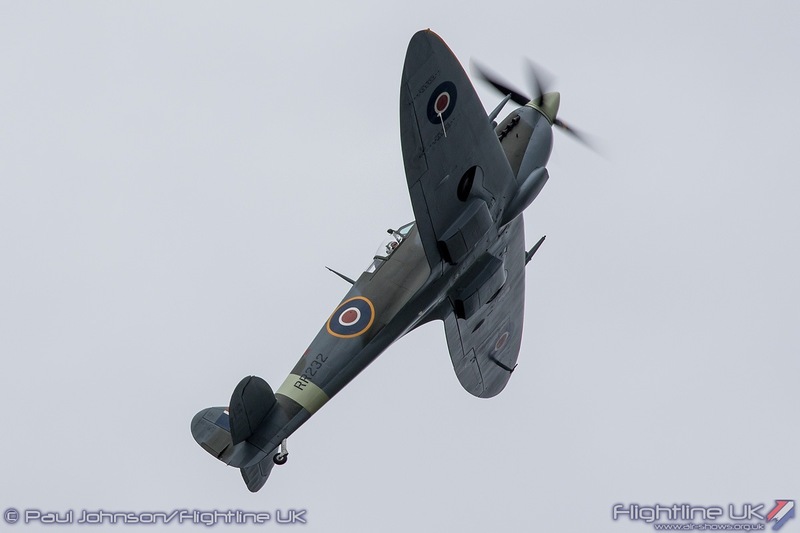 Both the Royal Navy and Army Air Corps also contributed to the weekend flying displays. 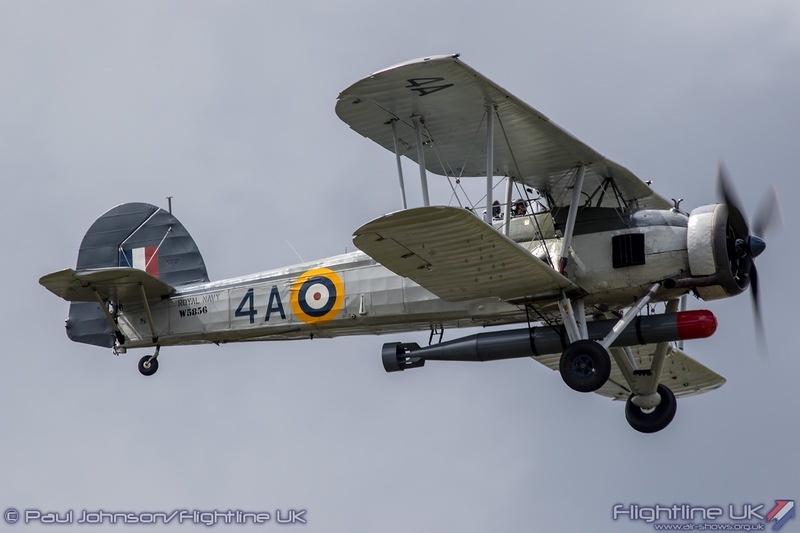 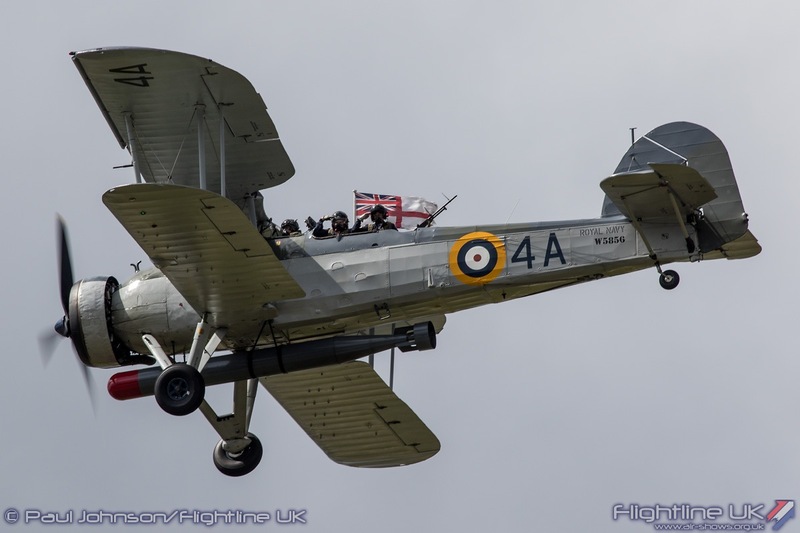 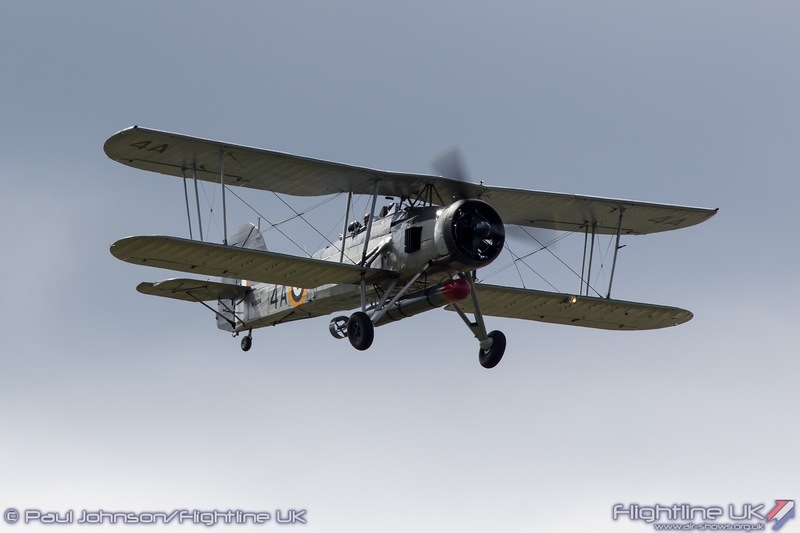 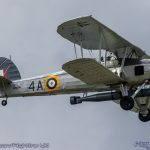 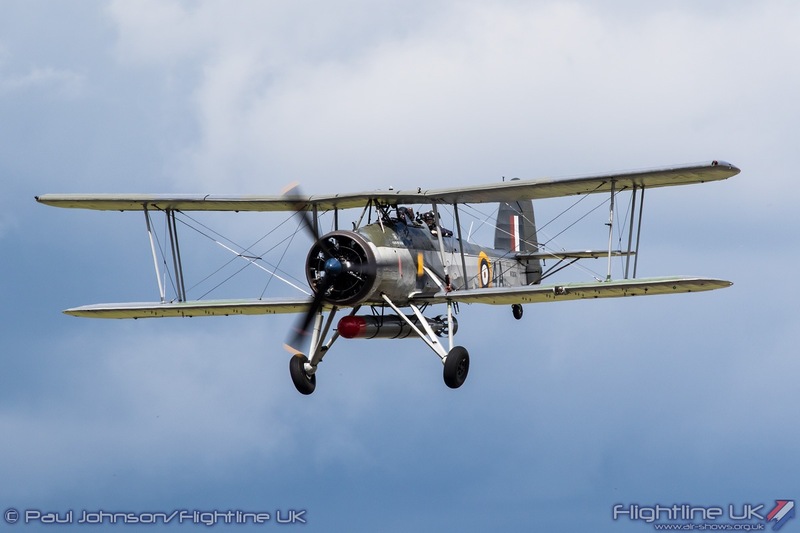 The Royal Navy Historic Flight made a welcome return to Farnborough with the Fairey Swordfish I flown by Lt Cdr Si Wilson. 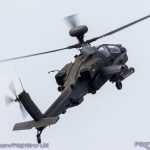 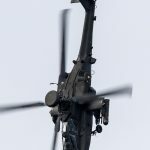 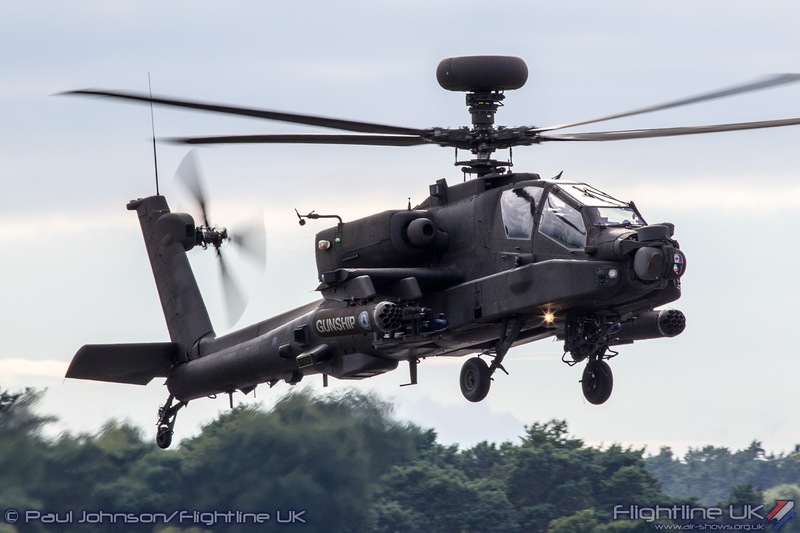 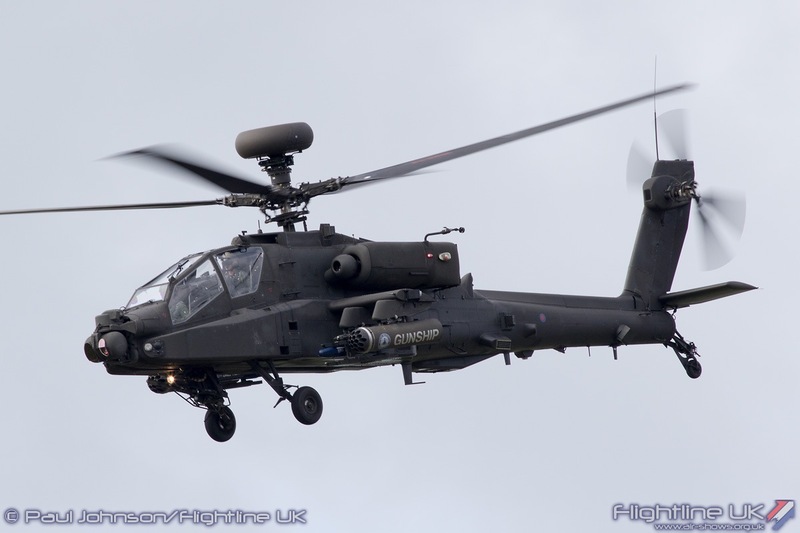 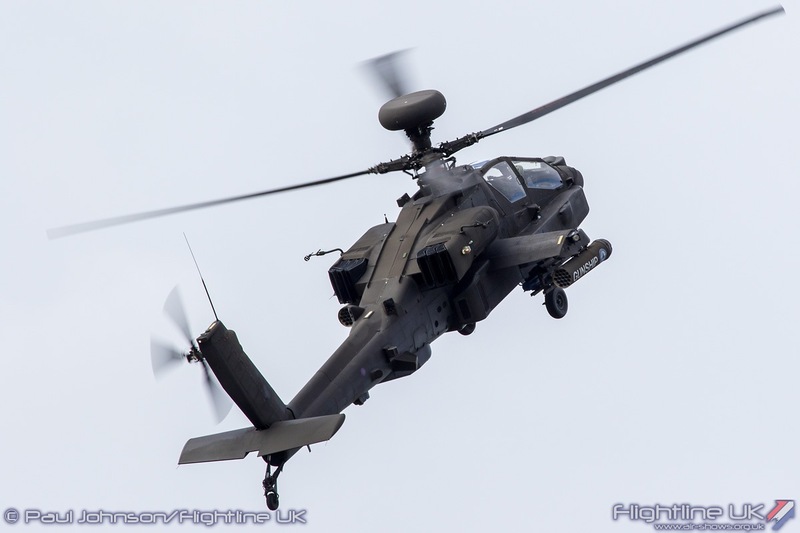 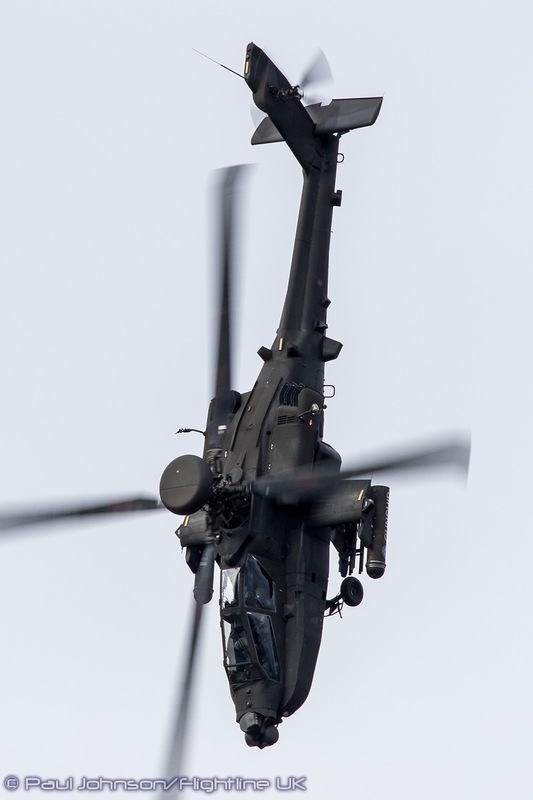 Providing an explosive finale to Saturday’s flying display was the Army’s Attack Helicopter Display Team flying a single AgustaWestland WAH-64D Apache AH1. 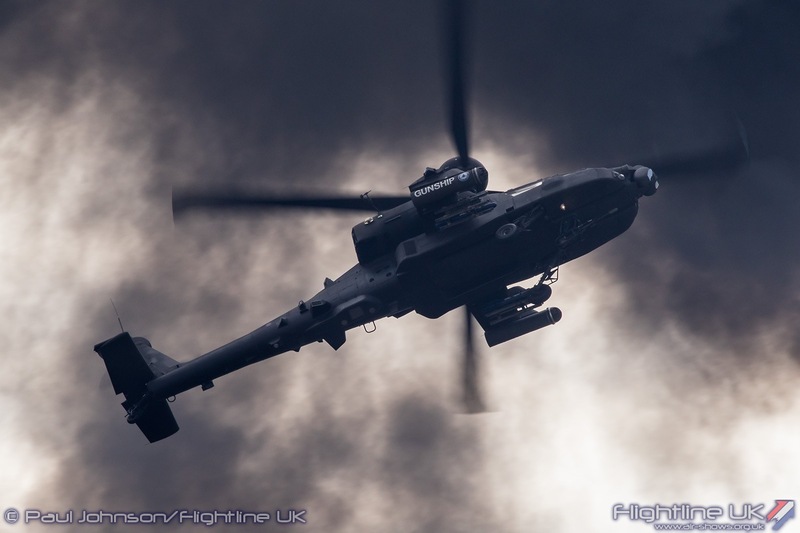 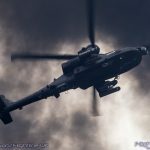 The display is a role demonstration of tactics used by the Apache force when on operations in areas such as Afghanistan and Libya and is complemented by the spectacular pyrotechnics of Event Horizon. 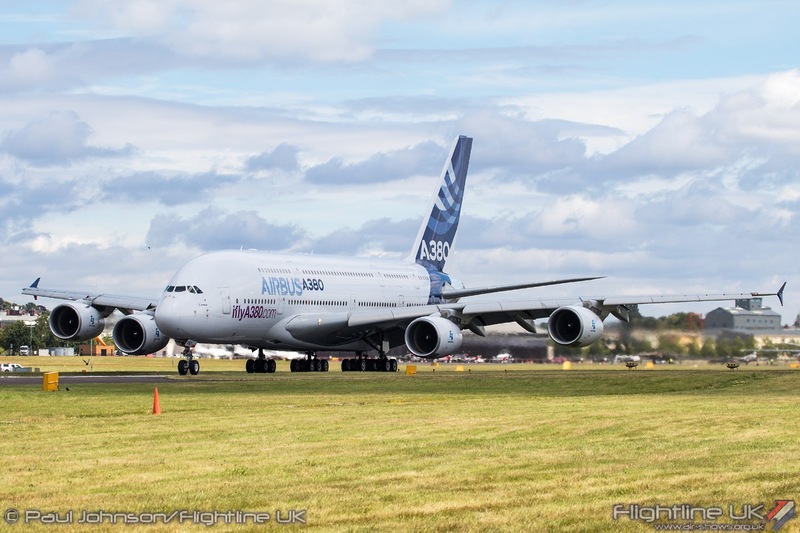 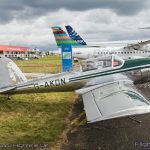 The Airbus Group always provide some of the major highlights for the public days at Farnborough. 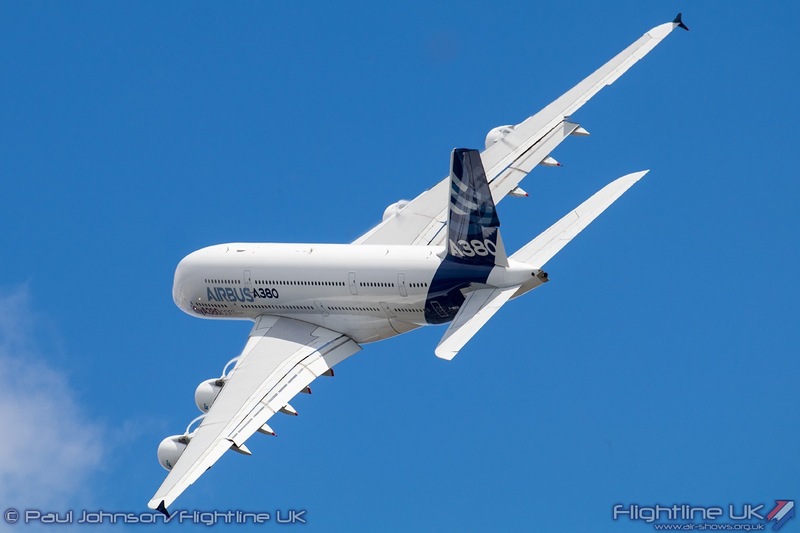 The Airbus A380 display really is a crowd pleaser and has been for the last 10 years. 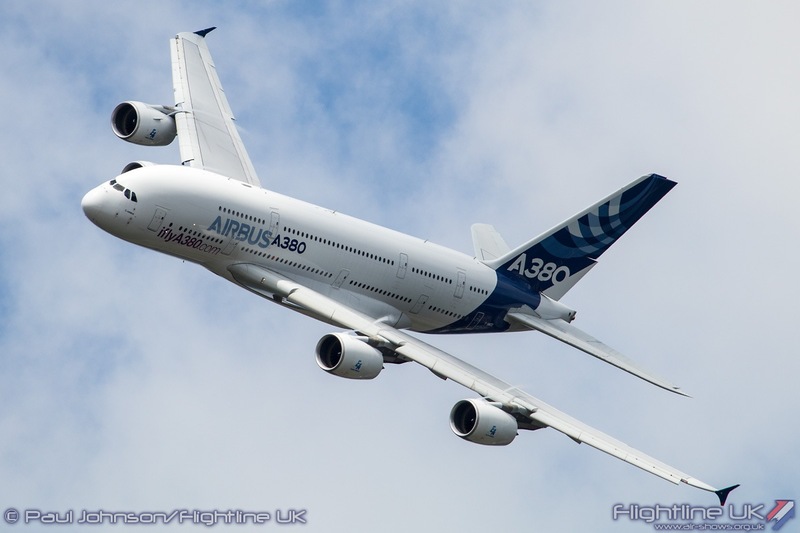 Its immense size and agility means it captures everyone’s attention even if they are not that interested in aeroplanes. 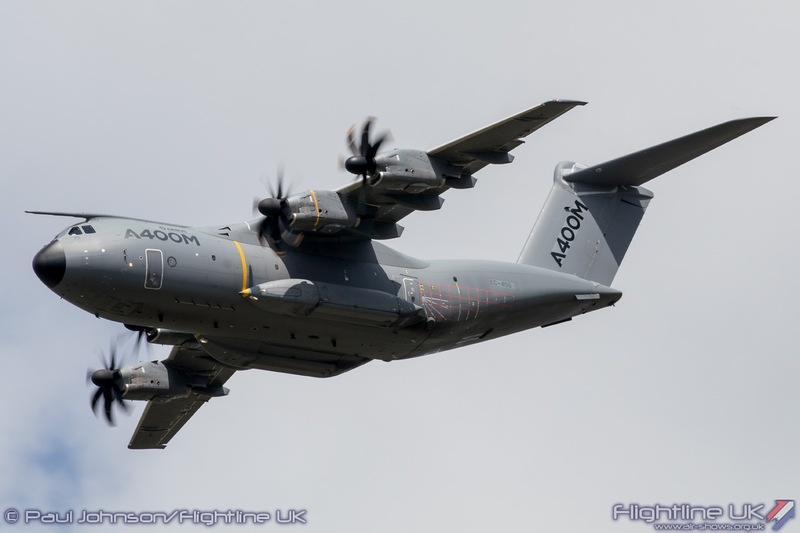 They followed up the A380 with their A400M Atlas display routine which also proved a very popular display. 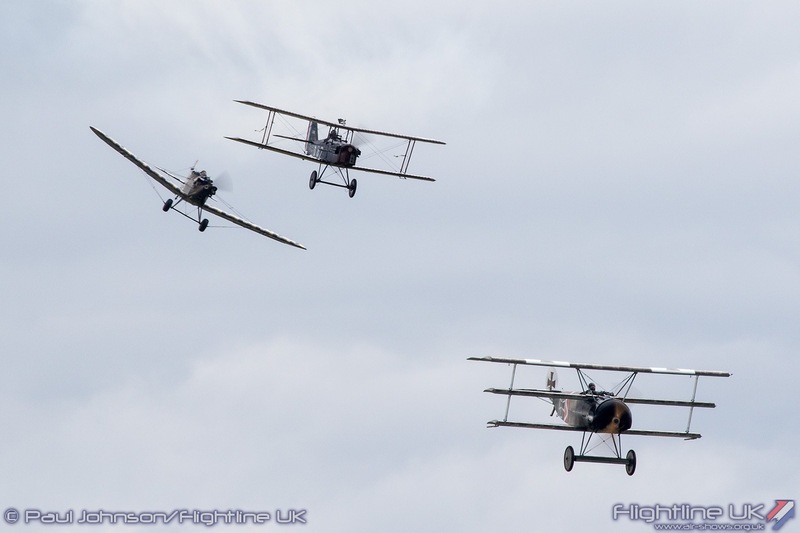 Airbus was not the only trade participants to appear in the weekend flying display. 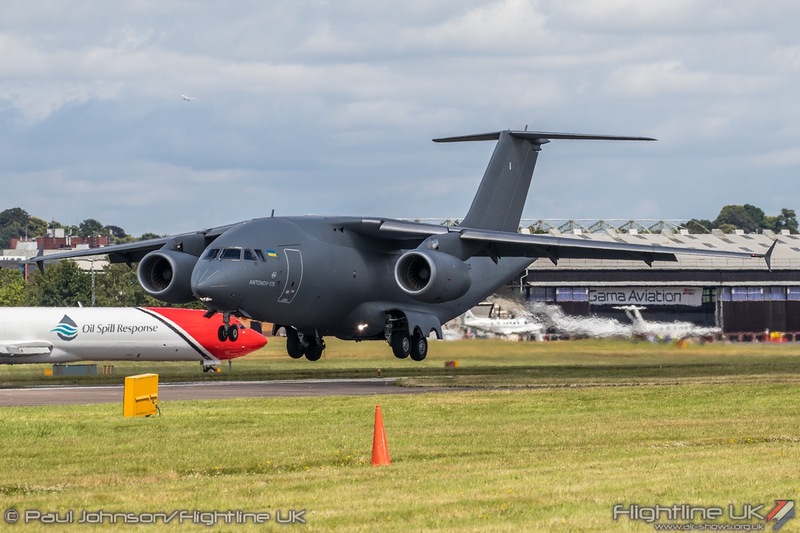 Saturday saw the Antonov An-178 give its final display before heading home. 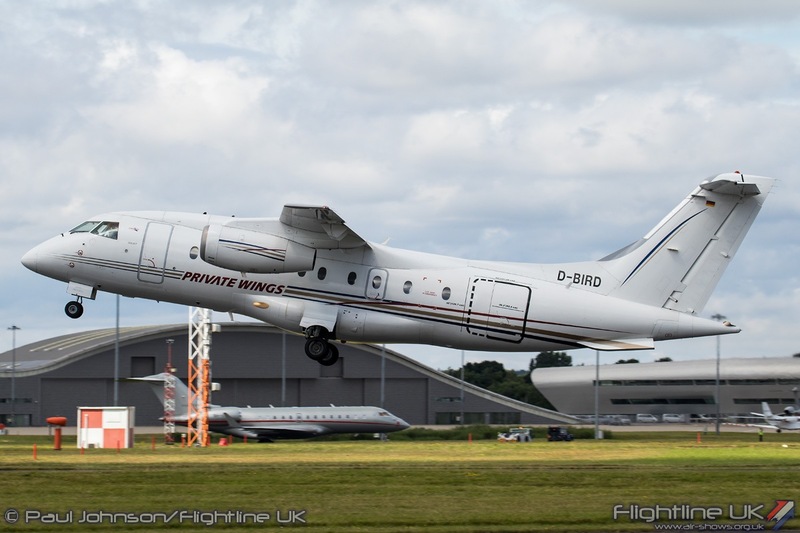 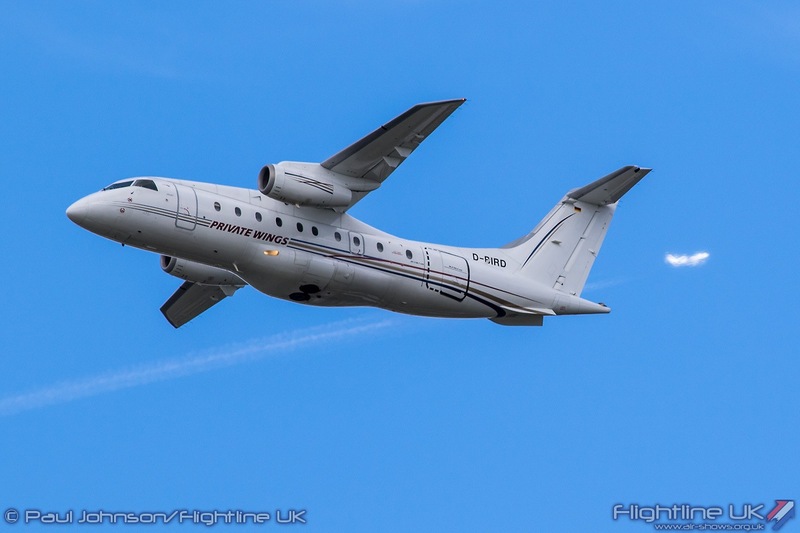 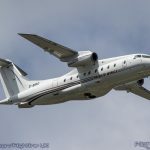 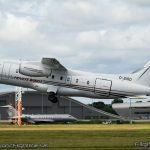 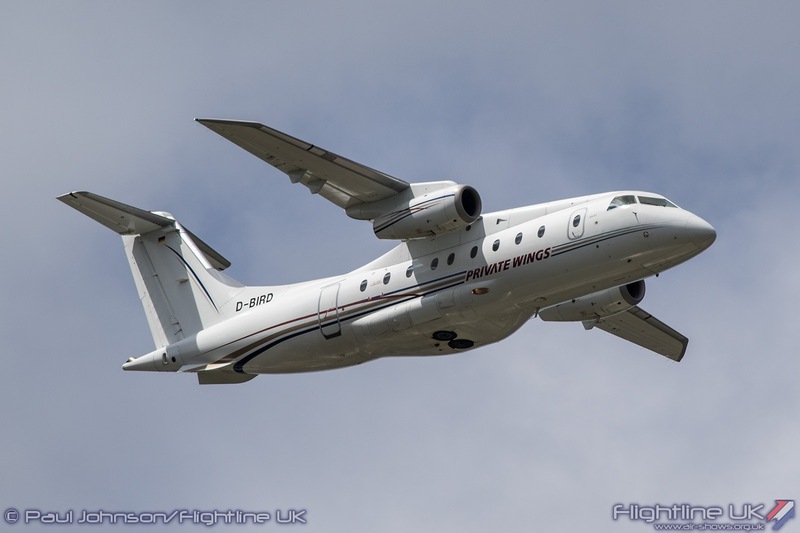 TRJet also continued to display the Dornier 328 and 328JET aircraft into the weekend too. 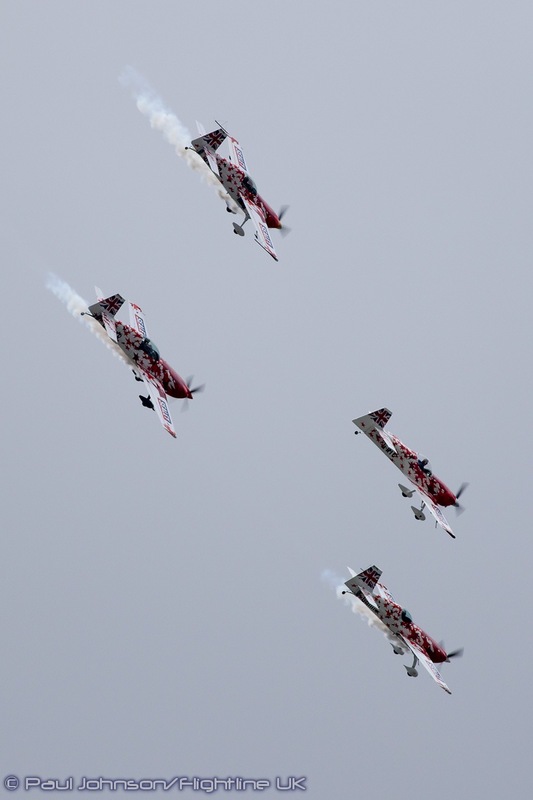 By far the biggest attractions from the trade week are the fast jet displays. 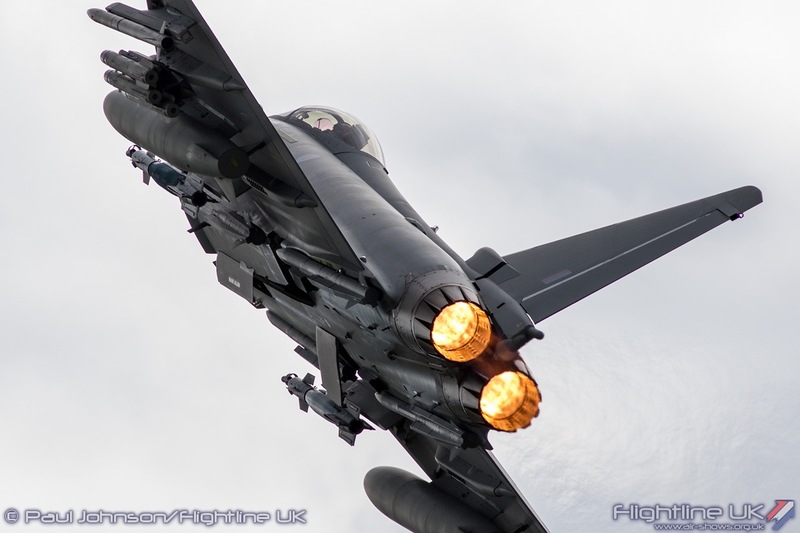 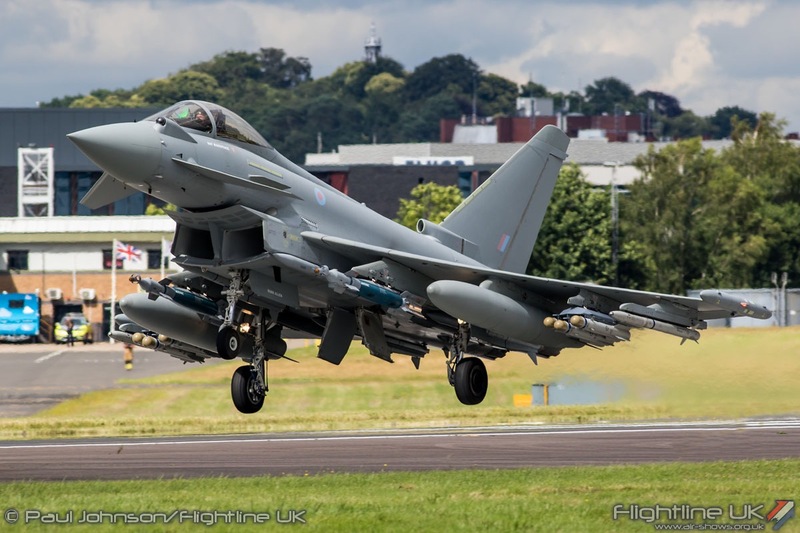 BAE Systems made sure the Eurofighter Typhoon remained at the forefront of the flying display. 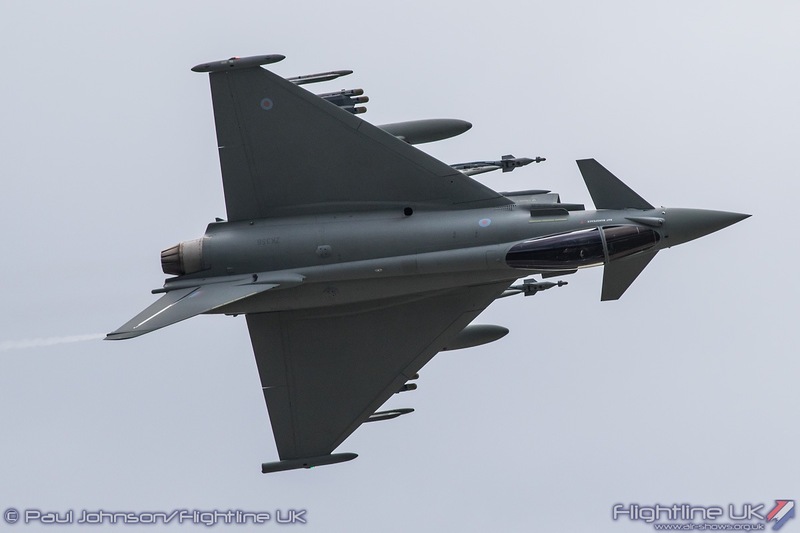 Nat Makepeace displayed aircraft IPA7 fitted with the Phase 3 enhancements weapons (P3E) load in a routine that showed the superb handling and performance of the Typhoon. 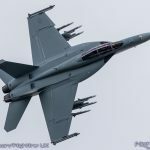 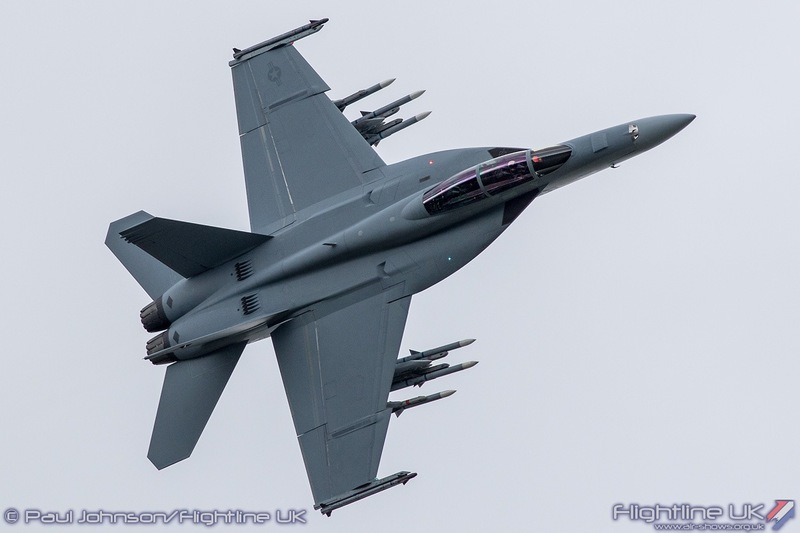 Boeing also contributed to the public weekend with the F/A-18F Super Hornet. 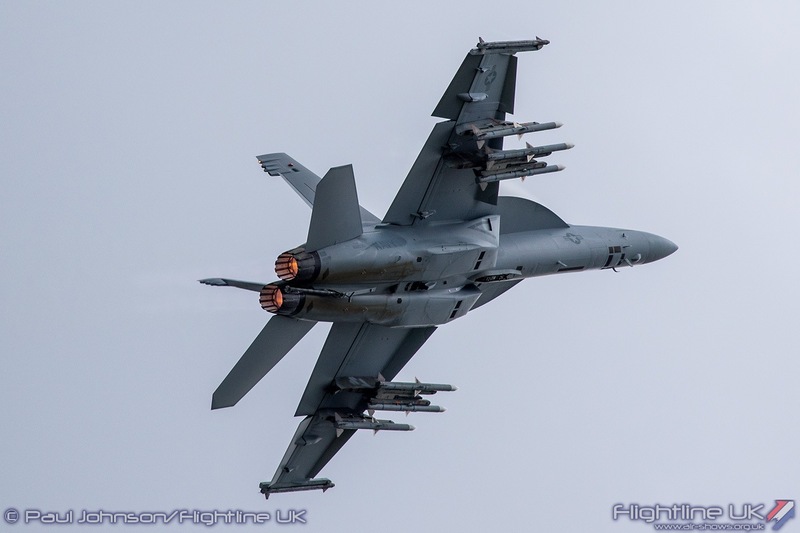 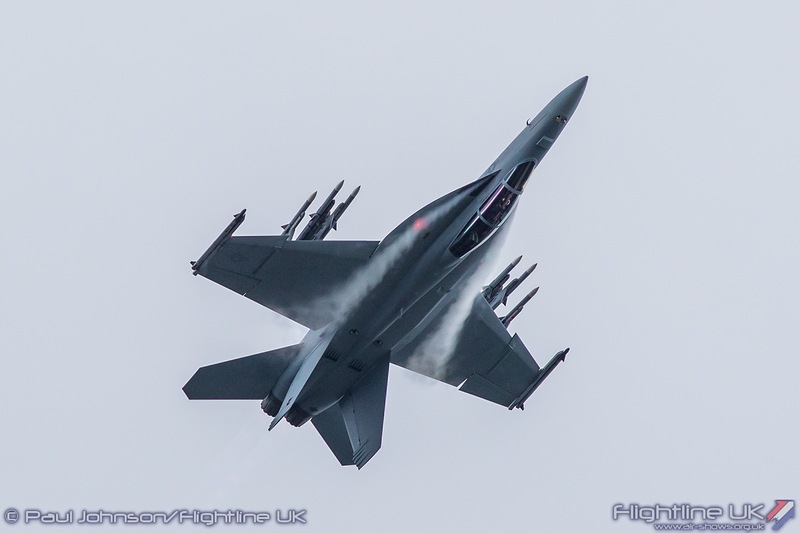 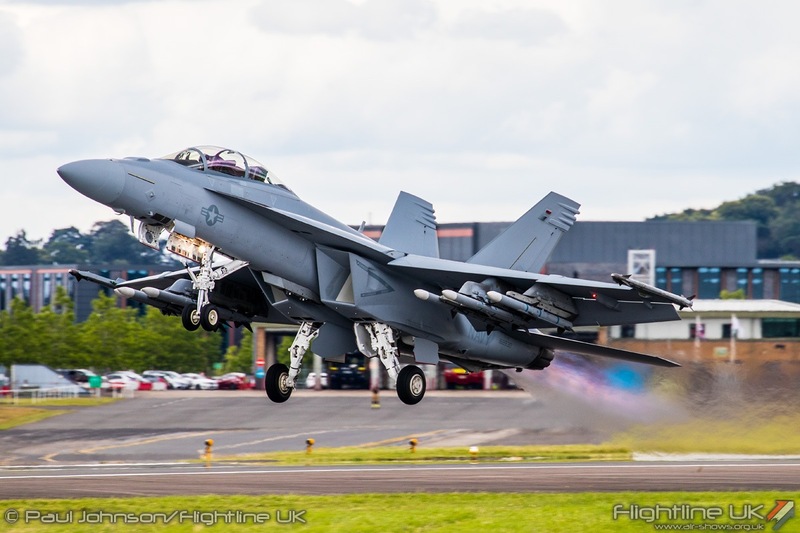 While the Super Hornet has been a Farnborough regular, it never ceases to catch the eye with its dramatic, noisy routines over the Hampshire airfield. 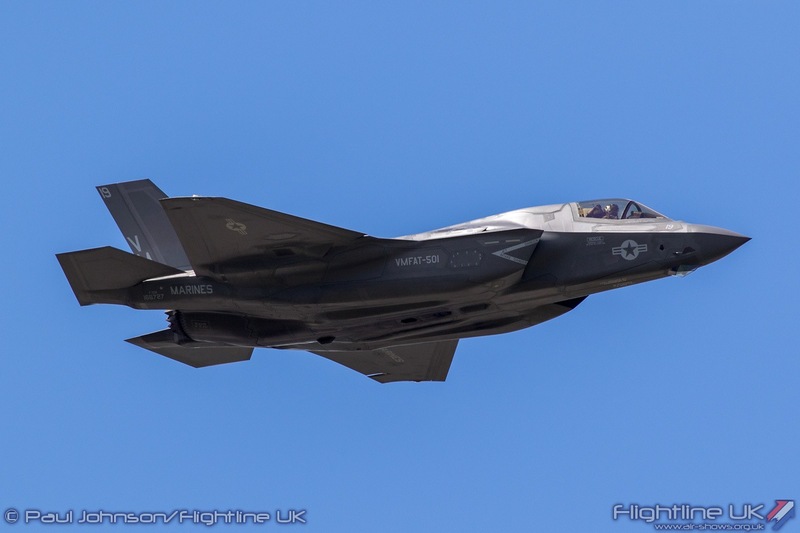 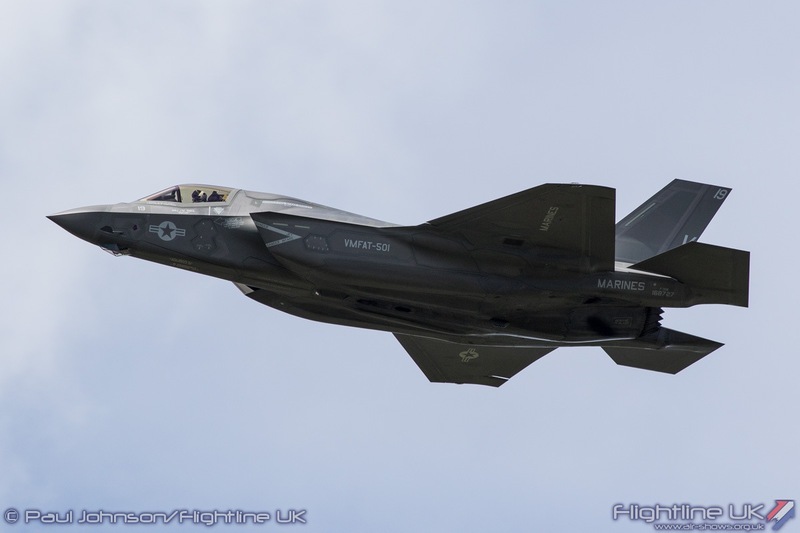 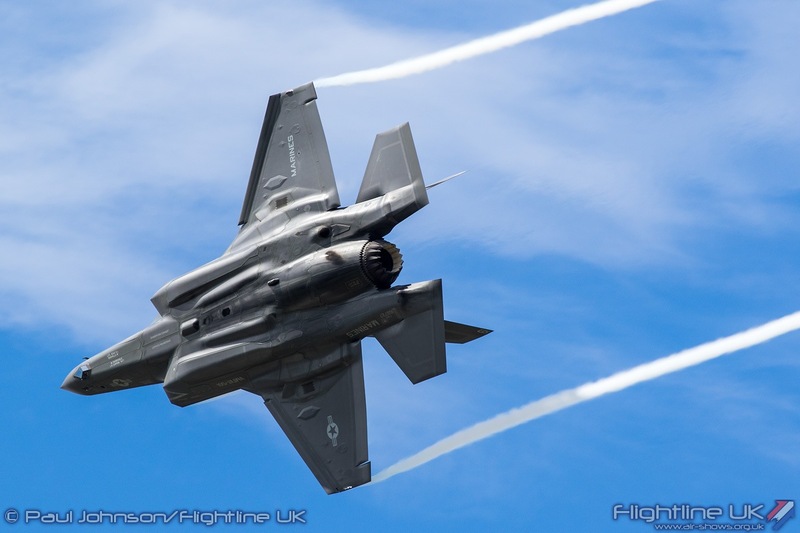 However the main attraction was the Lockheed Martin F-35B Lightning II. 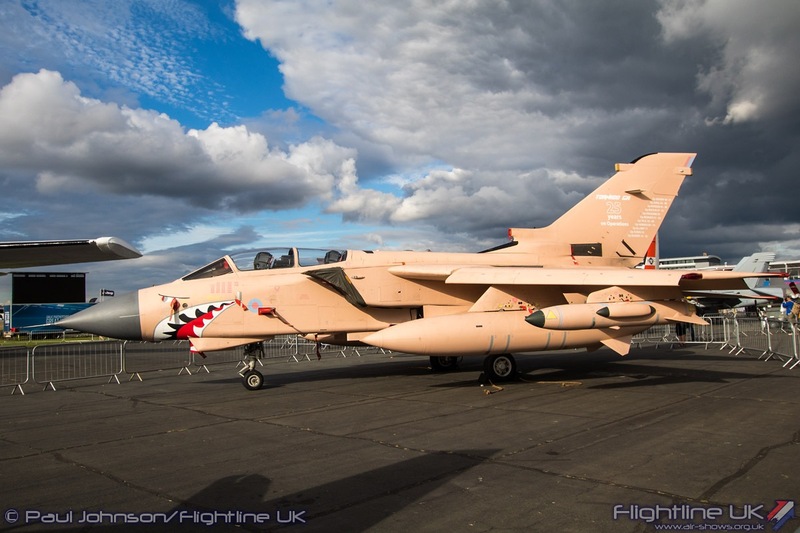 The aircraft were deployed from the US Marine Corps Squadron VMFAT-501 where the RAF and Royal Navy have embedded personnel to develop skills with the aircraft. 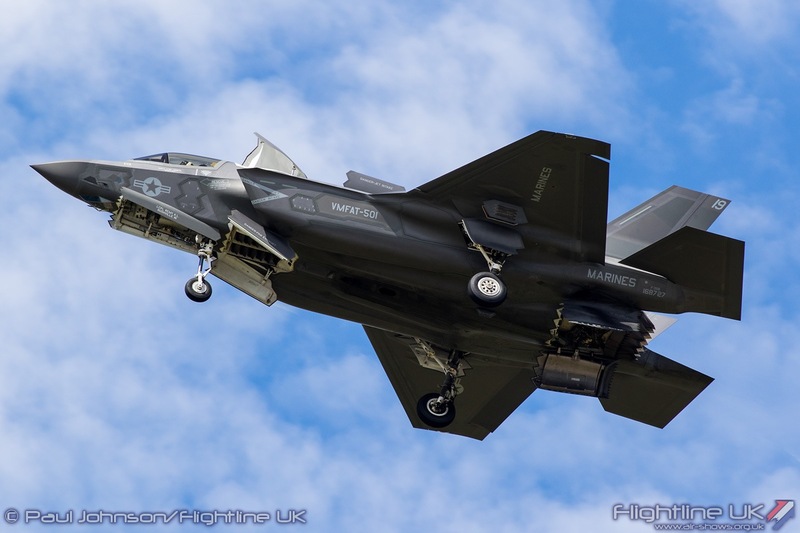 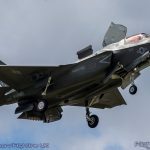 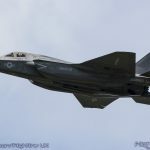 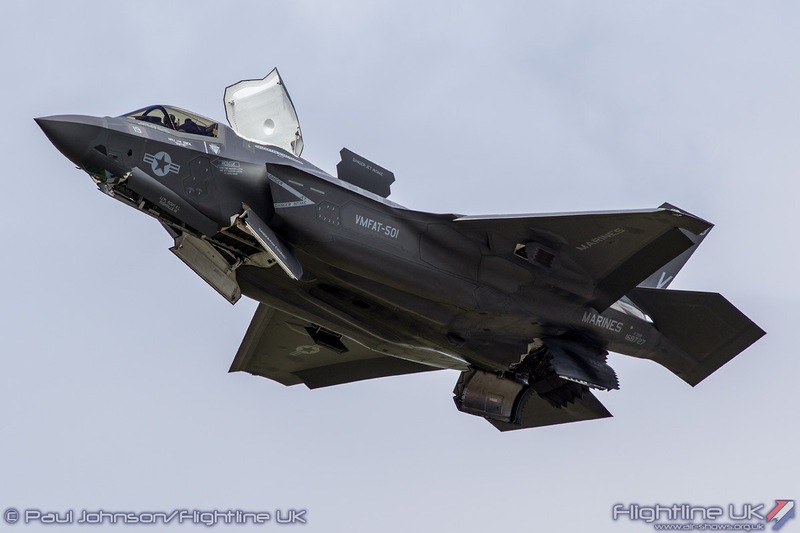 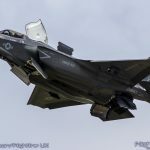 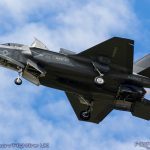 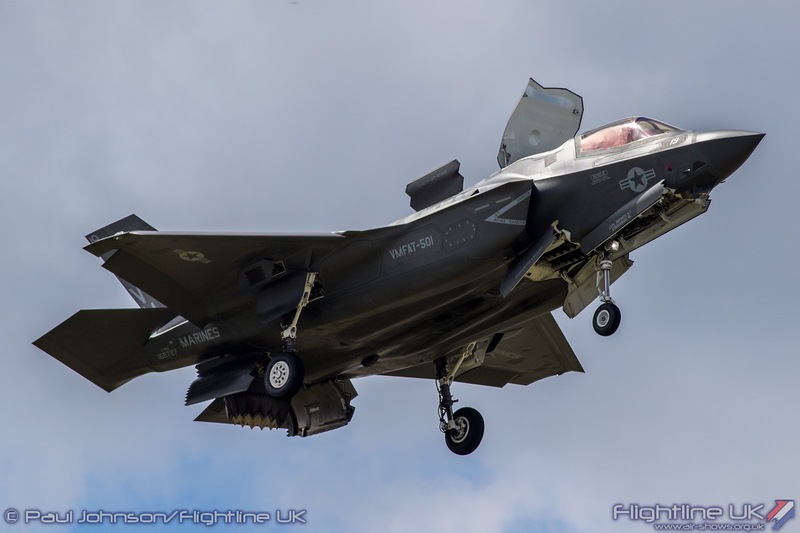 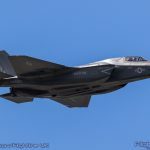 Throughout their UK deployment, the F-35Bs were based at RAF Fairford and “toured” in and out of Farnborough without landing, It was great to see the UK MoD and USMC commit to showing off the aircraft on the public days allowing them to see the future of UK fast jet operations from land and sea. 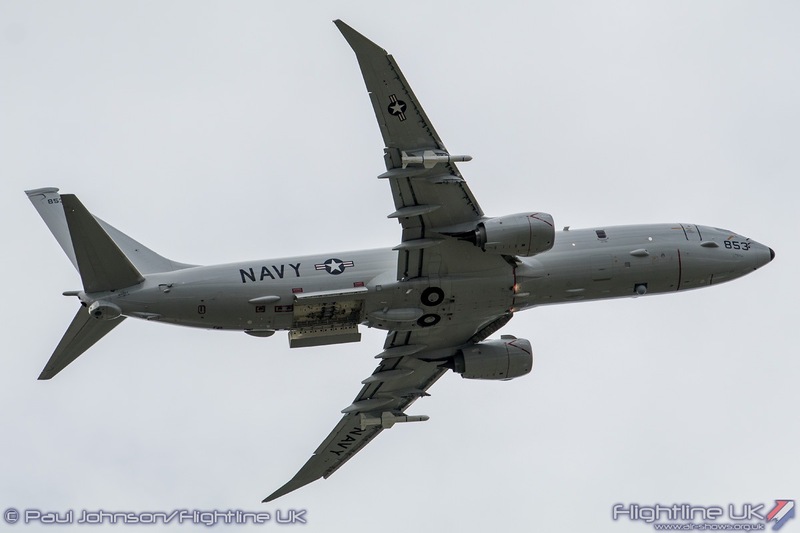 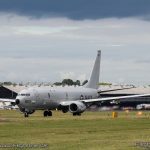 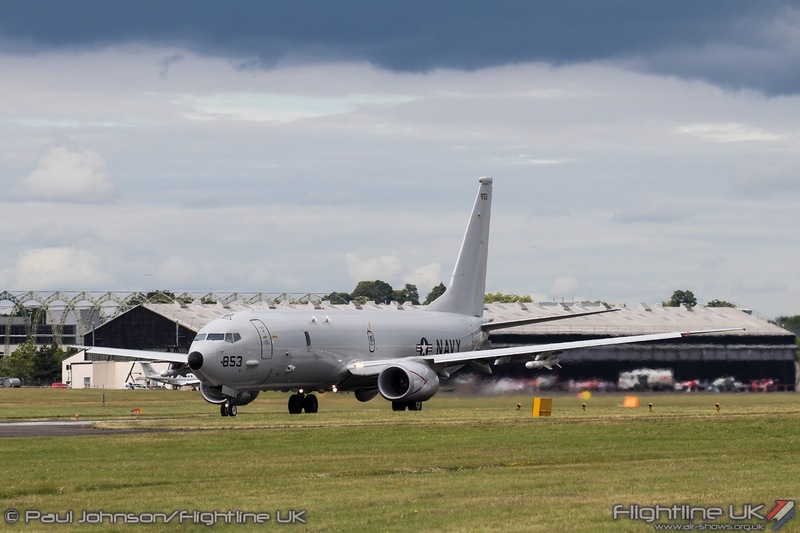 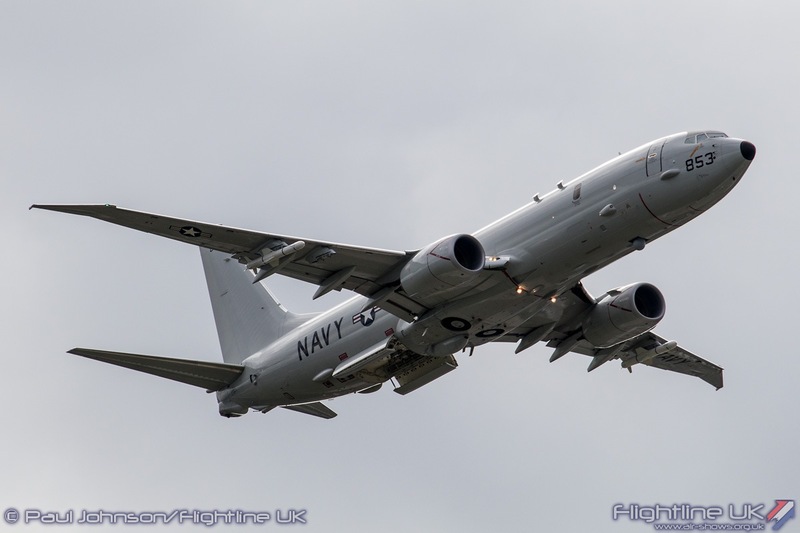 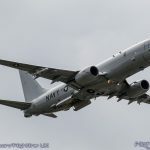 Another future RAF type flying during the public weekend was the Boeing P-8A Poseidon. 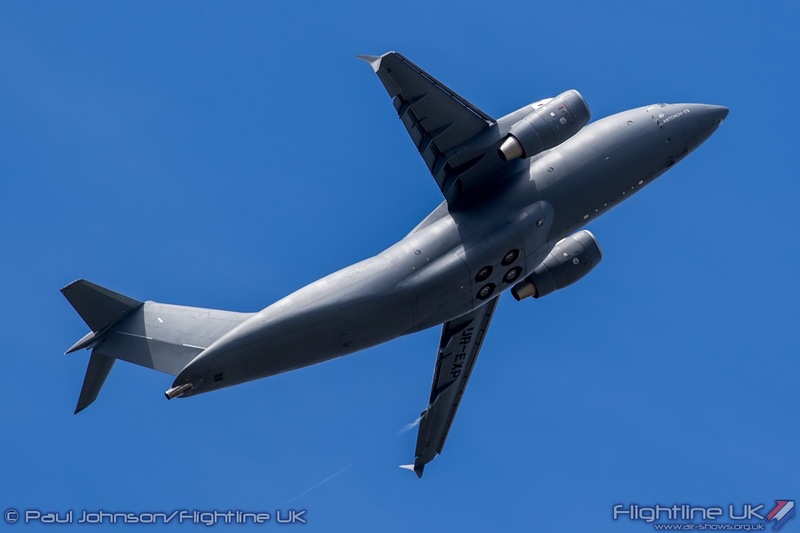 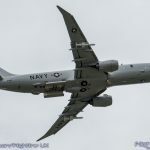 During the opening day of the Trade Week, contracts were signed confirming the purchase of nine examples of the highly sophisticated maritime patrol aircraft for the RAF. 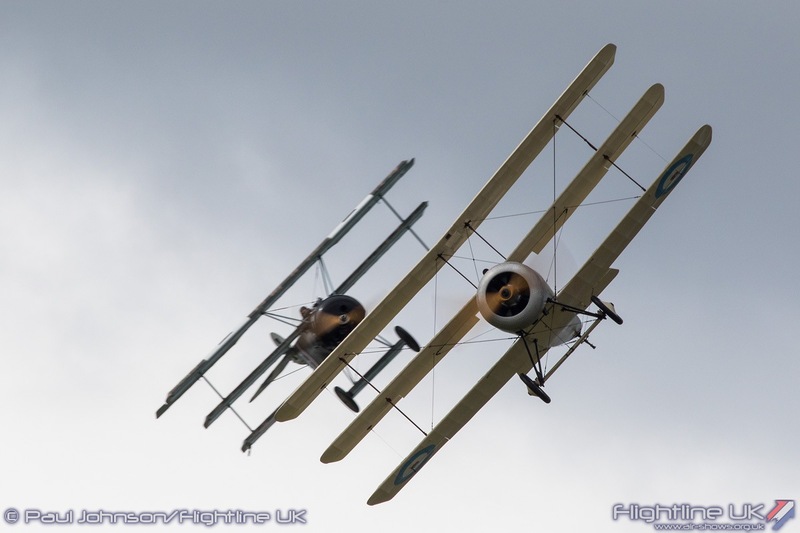 Much of the flying programme at the weekend looked at historic types and told the story of aviation development. 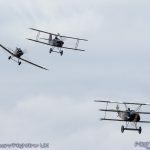 The Great War Display Team marked Farnborough’s involvement with aviation 100 years ago during the First World War. 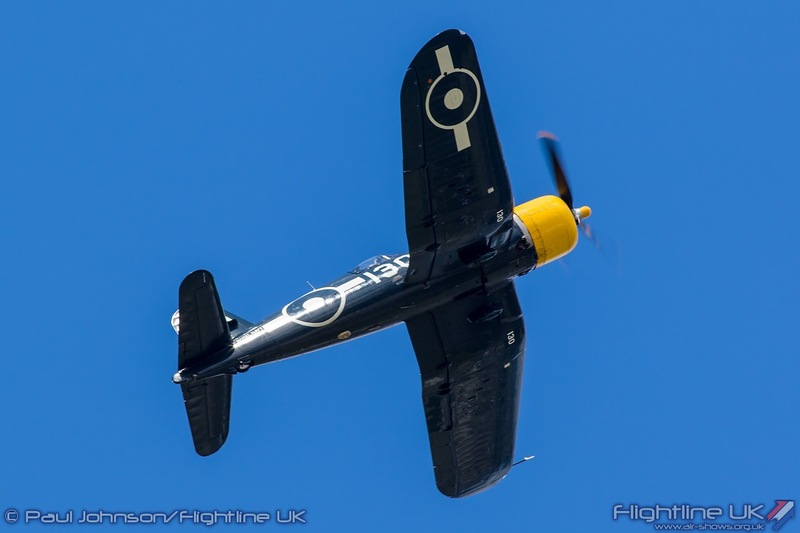 The famous black sheds, always a landmark during the Farnborough airshow gave birth to types such as the RAF SE5a. 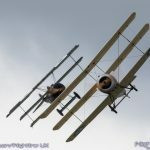 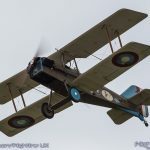 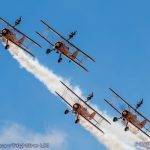 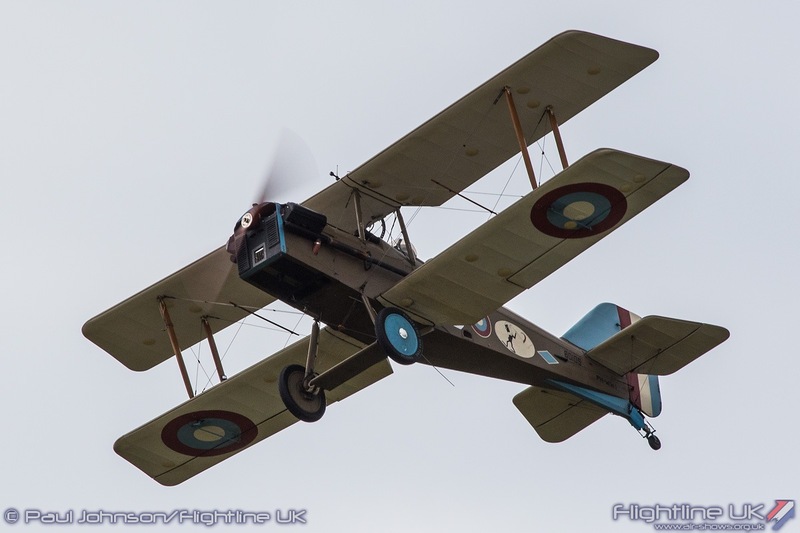 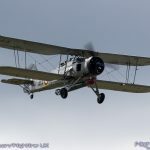 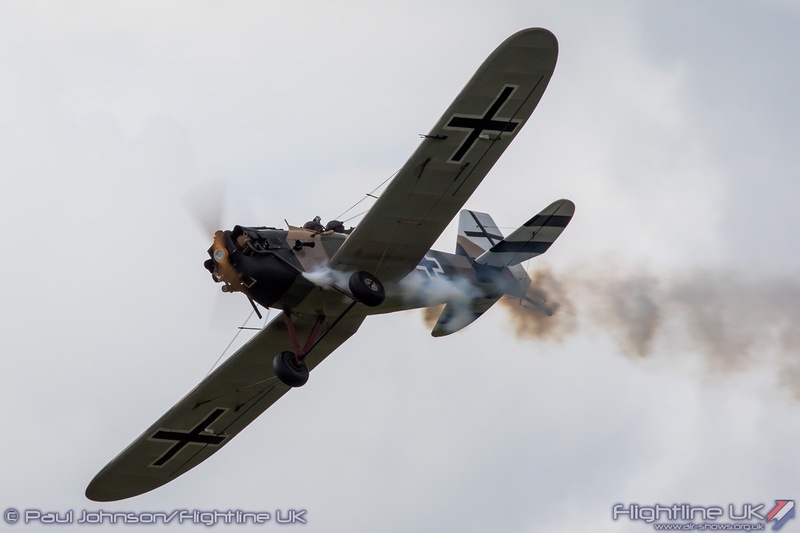 The GWDT flew an eight-ship of replicas during Farnborough comprising of two Junker CL1s, two Fokker Dr1s, the Sopwith Triplane and three RAF SE5a. 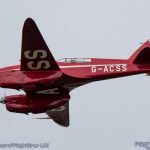 The air display also looked at the time after World War One and the advance of civilian aerospace technology with the Shuttleworth Collection’s de Havilland DH88 Comet making a very rare appearance away from its base at Old Warden. 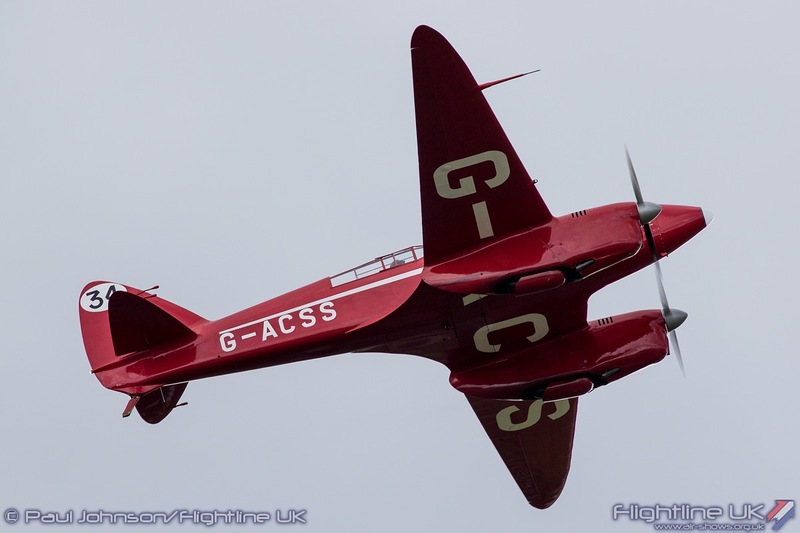 Friday and Sunday also saw some flypasts from an American 1930’s airliner, the Lockheed Electra. 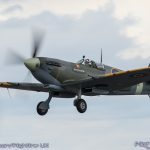 The heavy iron of the Second World War provided a great deal of flying action with both fighters and bombers represented. 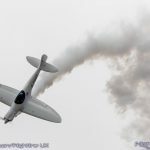 No Farnborough would be complete with a Spitfire solo and this year it was the turn of The Boultbee Academy who sent their Supermarine Spitfire IX RR232. 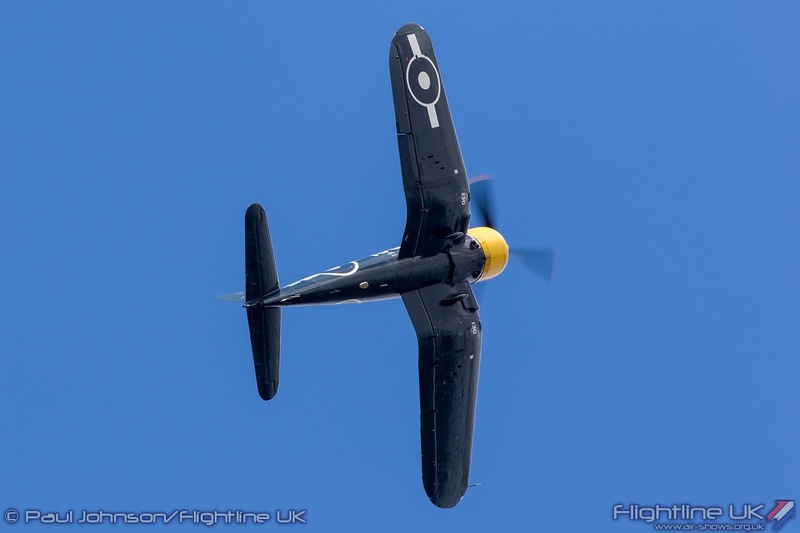 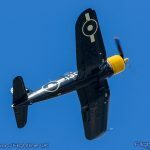 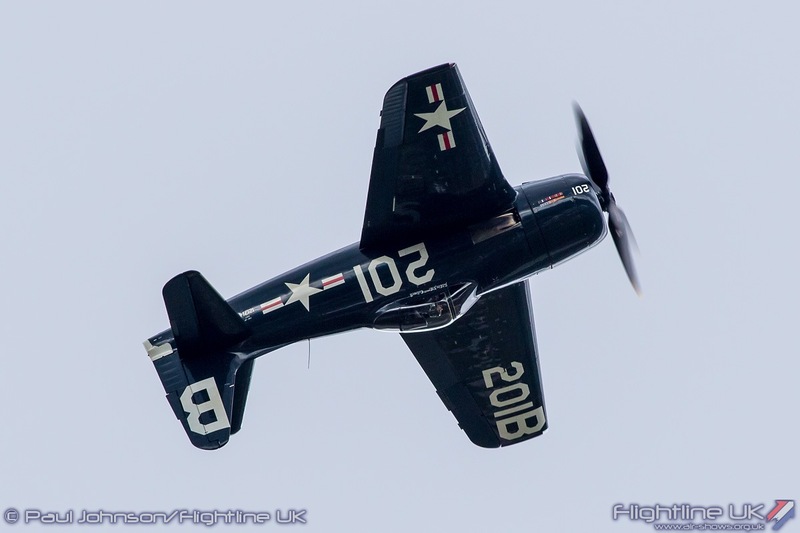 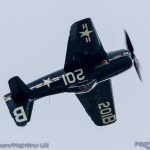 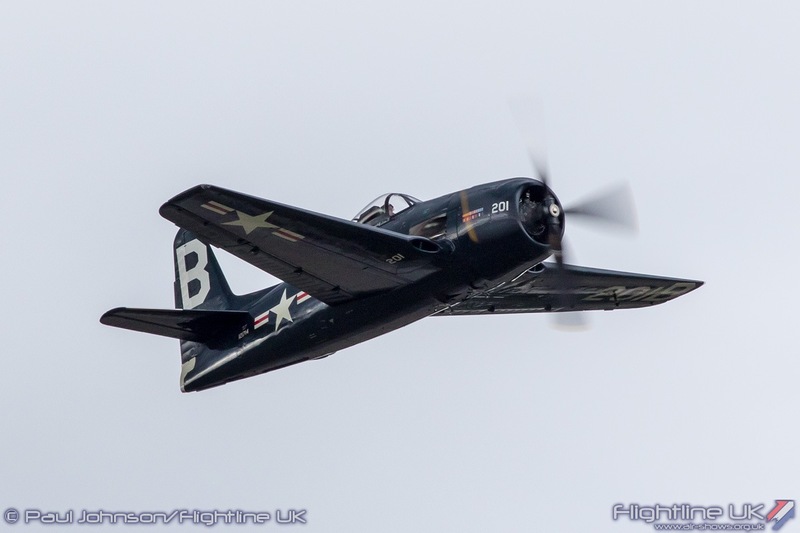 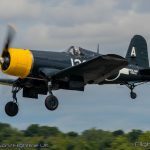 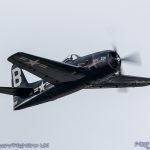 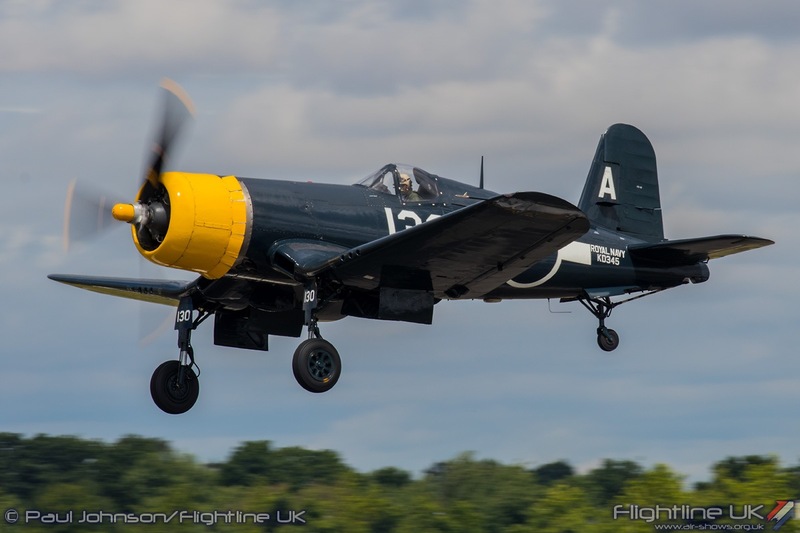 The Fighter Collection provided two more solo fighter displays during the afternoon with the Goodyear FG-1D Corsair and Grumman F8F Bearcat marking the exploits of the US Navy and US Marine Corps in perhaps a nod to the heritage behind the F-35. 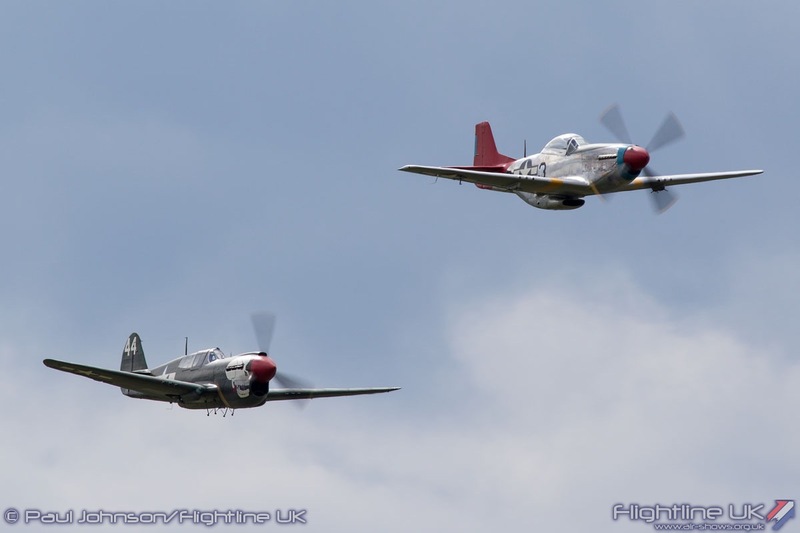 American land based aviation was represented by a pleasing duo from the Hangar 11 Collection. 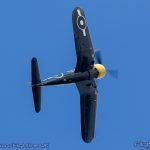 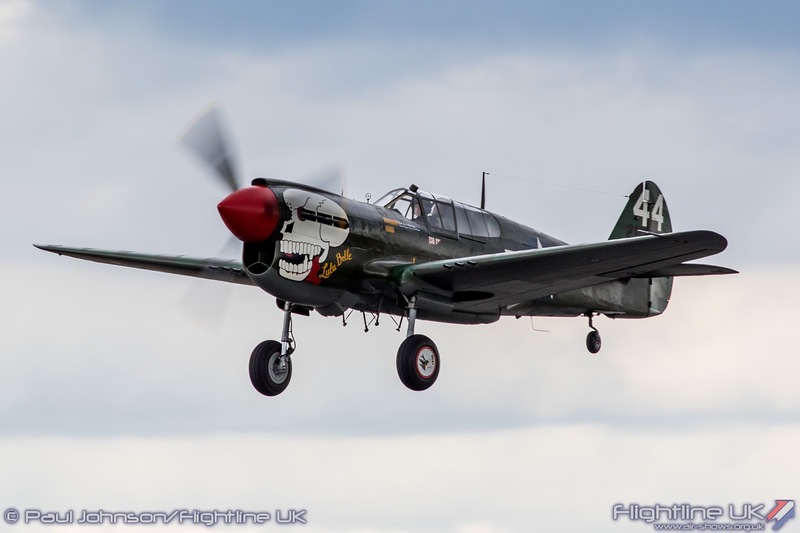 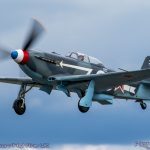 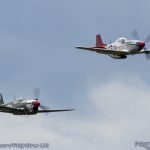 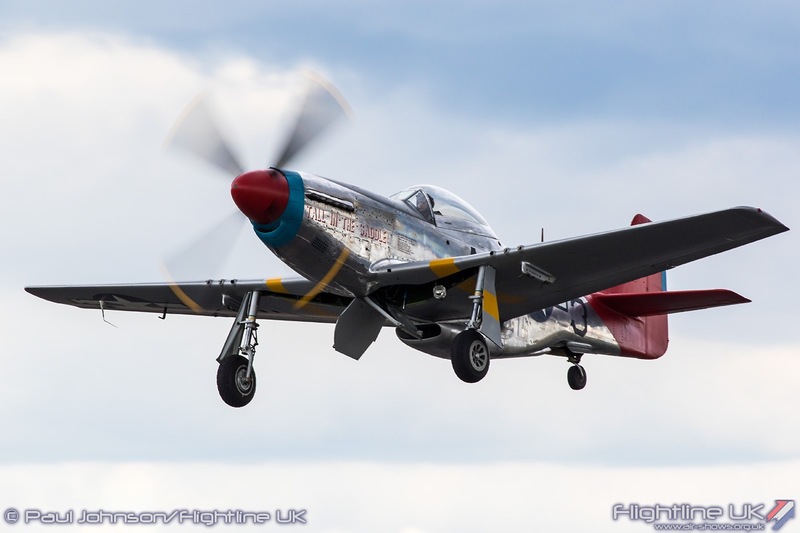 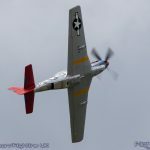 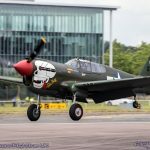 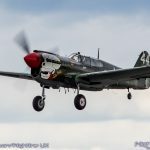 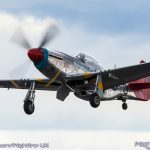 Peter Teichman flew his newly repainted North American P-51D Mustang and was joined by Dan Griffith flying the Curtiss P-40M Kittyhawk for some formation and solo passes. 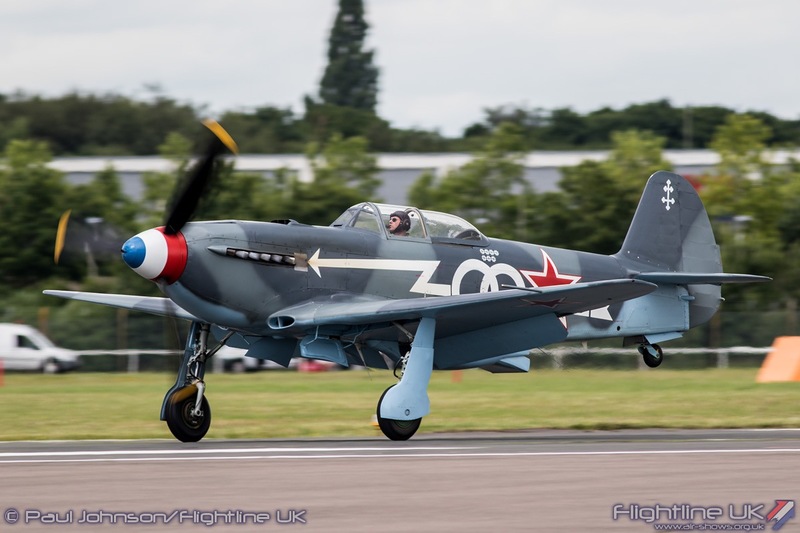 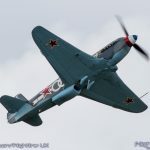 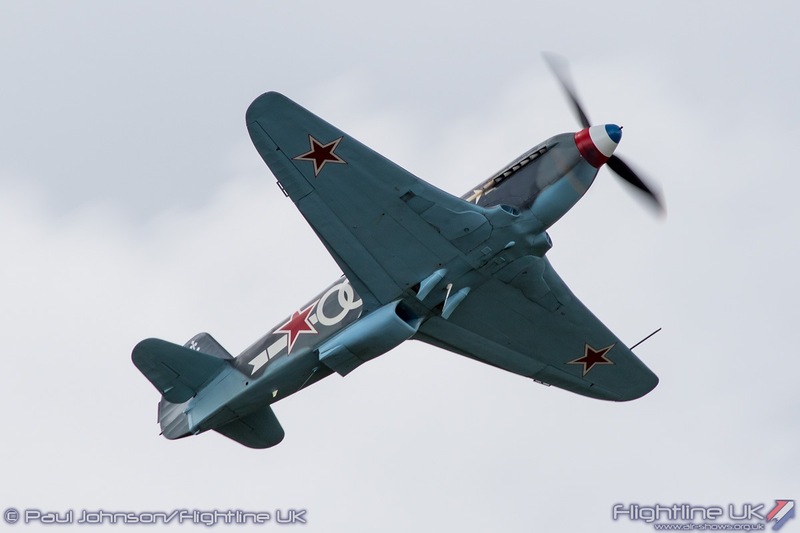 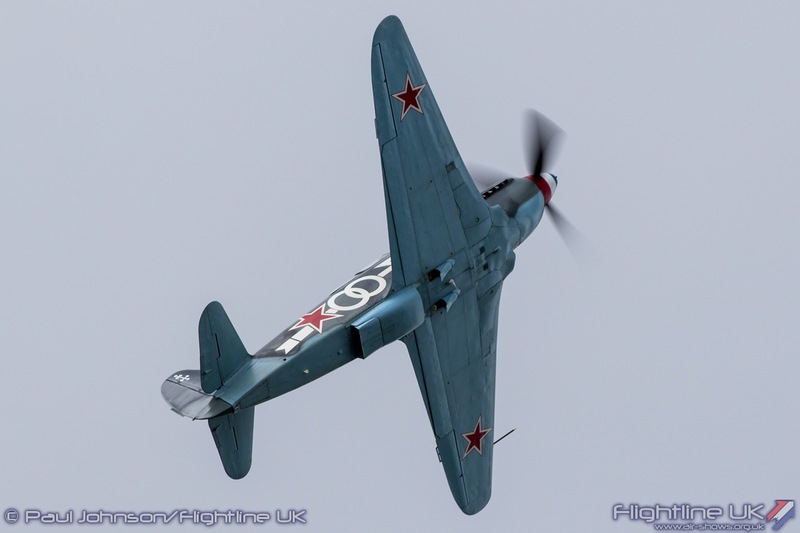 A rare addtion to the line-up was Will Greenwood’s Yakovlev Yak-3M. 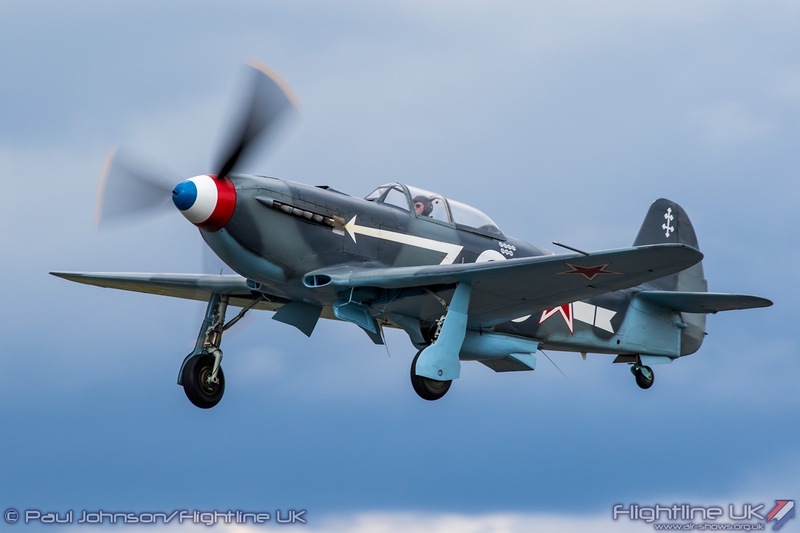 Powered by the american Allison engine, the Yak-3M is late production model built by the Yakovlev Design Bureau in the 1990’s. 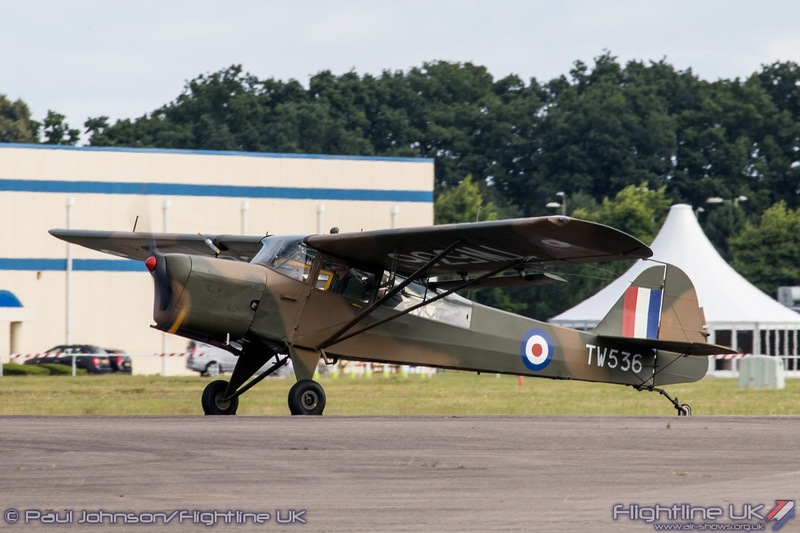 Will’s beautiful aircraft is finished in the colours of the famous Normandie Niemen Squadron, a unit of Free-French that fough alongside Soviet forces on the Eastern Front. 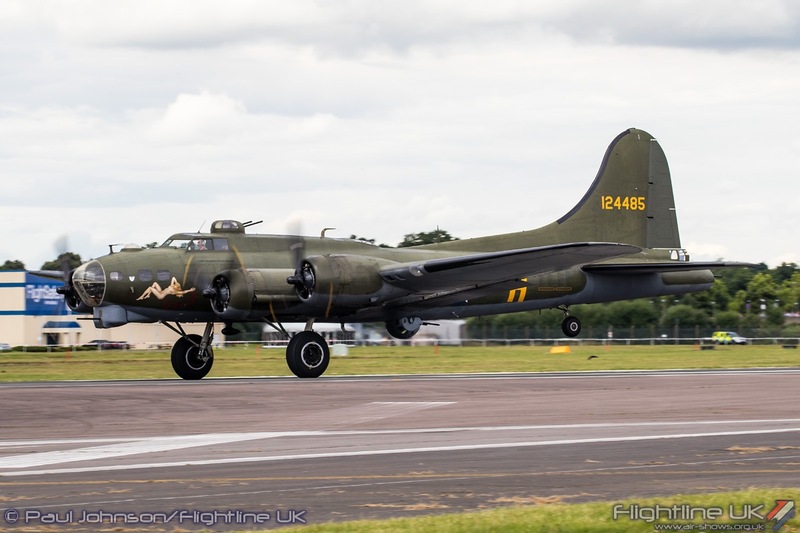 Sadly, the strict limits on display heights outside the airfield boundary prevented Boeing B-17G Flying Fortress Sally-B from conducting a full display. 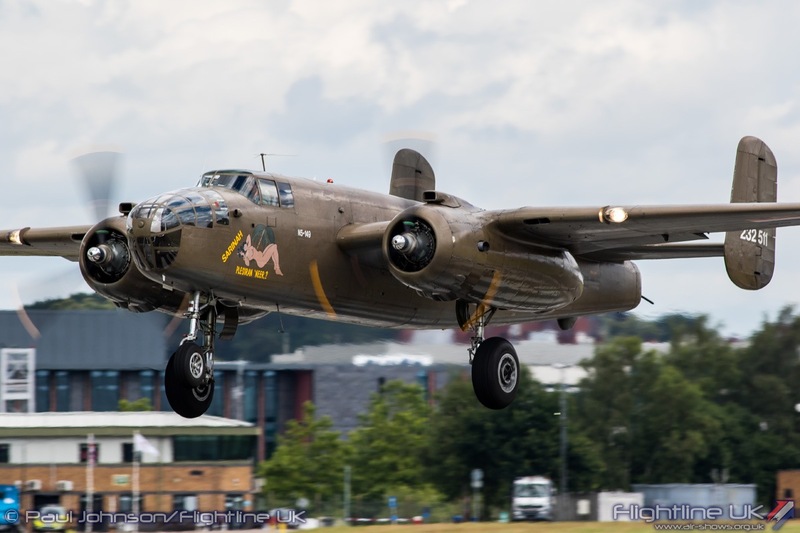 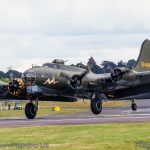 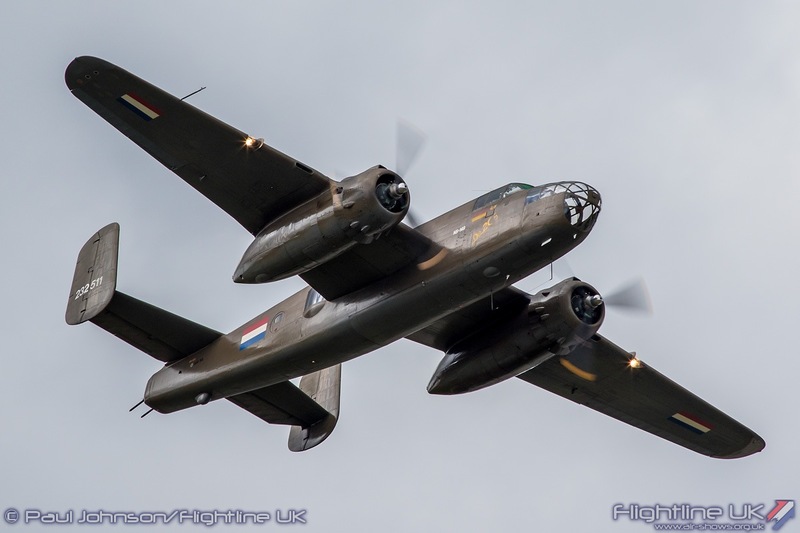 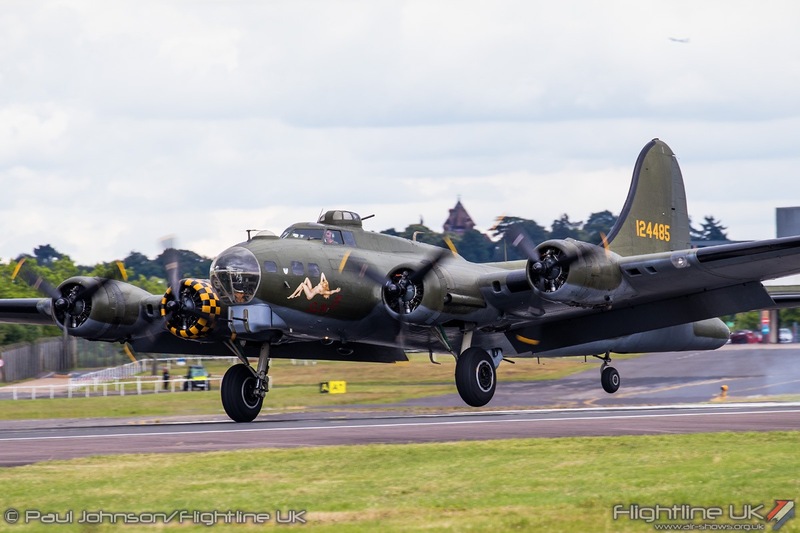 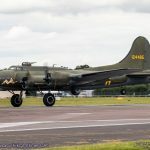 However, despite being limited to a take-off and landing, Farnborough provided some important publicity for the B-17 Preservation team and the chance to earn some much needed funds from B-17 tours. 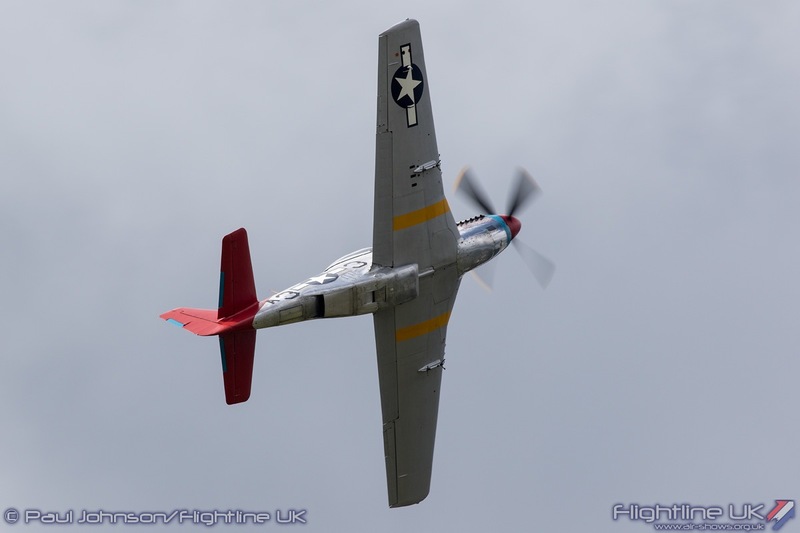 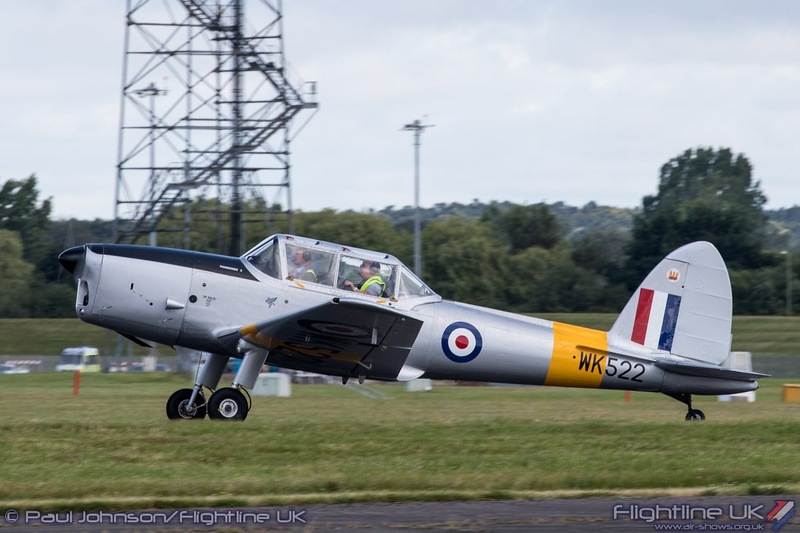 The Cold War saw little representation in the air, but the Bronco Demo Team did contribute to the show on Sunday (they were unable to display during Saturday as the flying programme ran late after an Air Ambulance flying into Frimley Park Hospital interrupted proceedings) with the North American OV-10B Bronco. 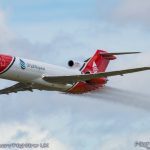 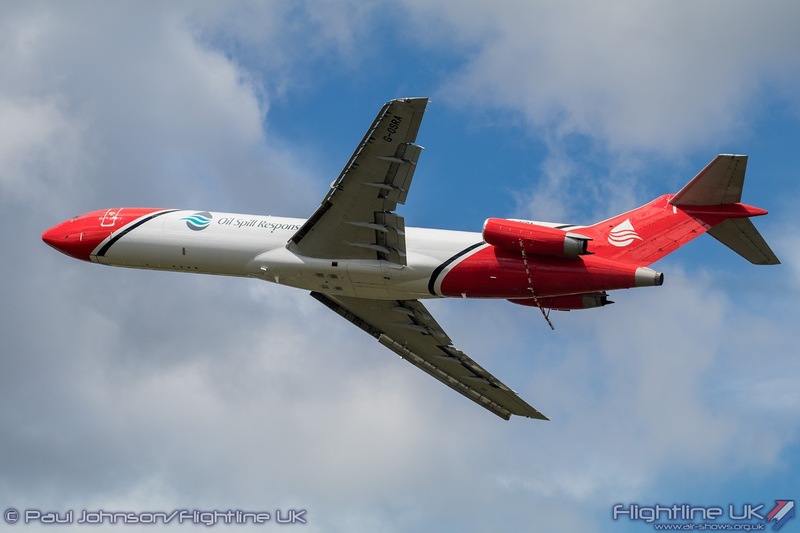 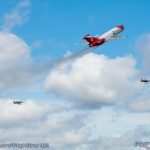 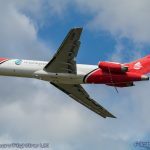 2Excel Aviation, T2 Aviation and Oil Spill Response had displayed their Boeing 727-2S2F aircraft all week during the Trade Week. 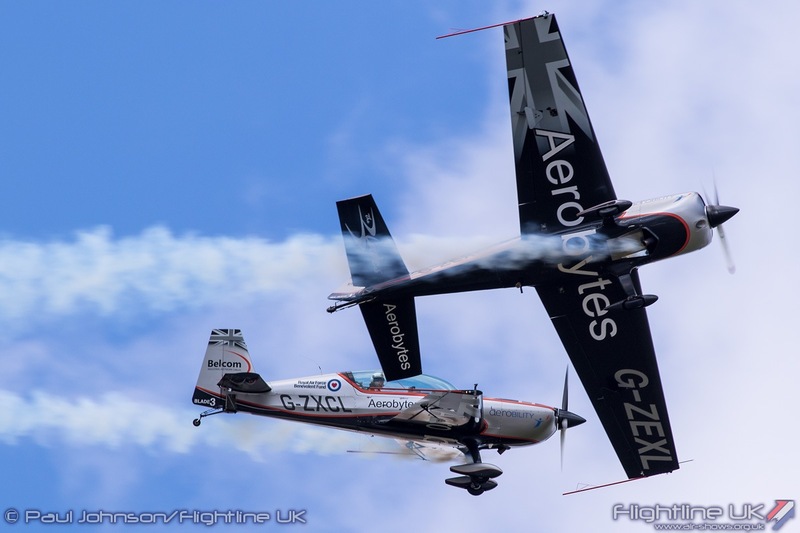 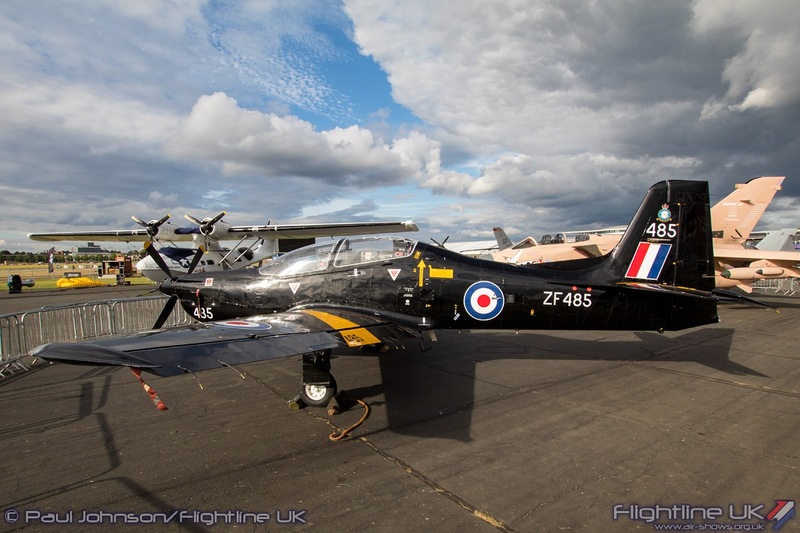 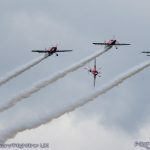 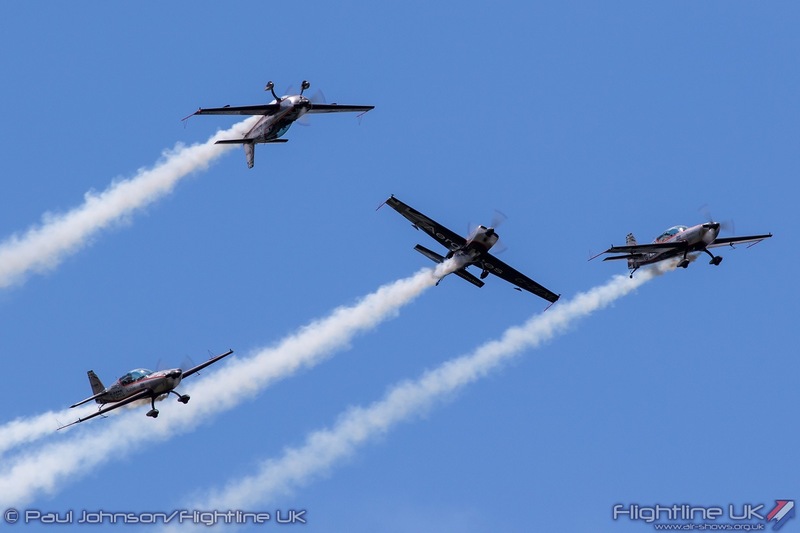 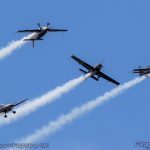 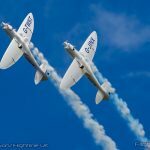 However, for the weekend displays they upped the ante linking the first flypast of the classic airliner with their sister operation, the Blades Aerobatic Team flying their four Extra 300LP aircraft. 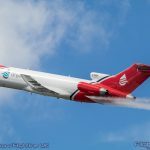 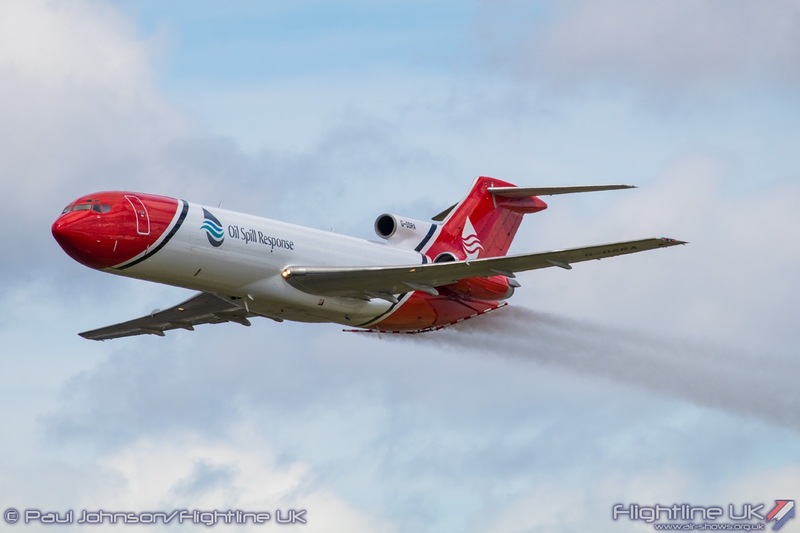 In the hands of Dan Griffith, the 727 also put more of display on with low turns and making a couple of passes demonstrating the dispersant spray booms. 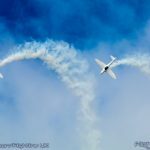 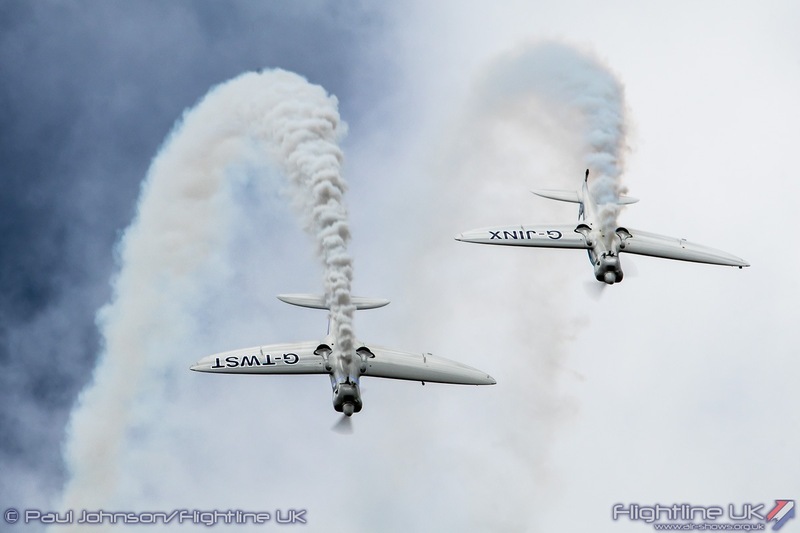 To close the 2Excel segment, the Blades put on a shortened version of their aerobatic display. 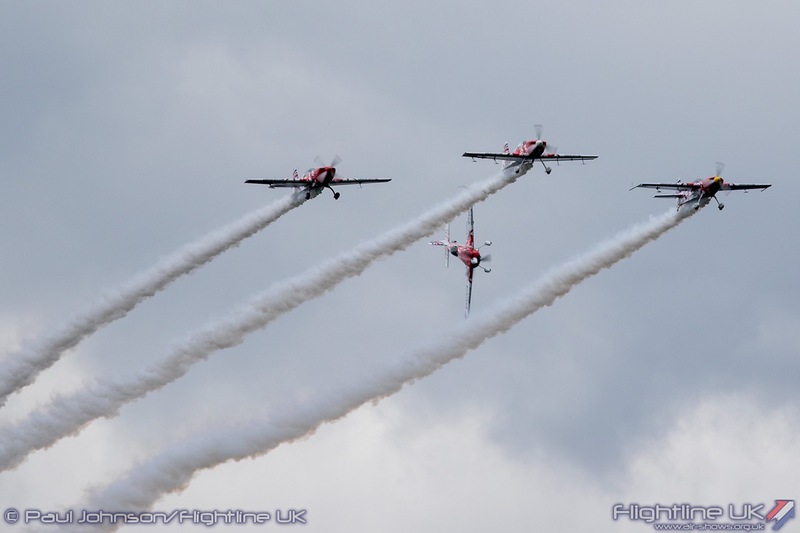 Joining the Blades were several other civilian teams. 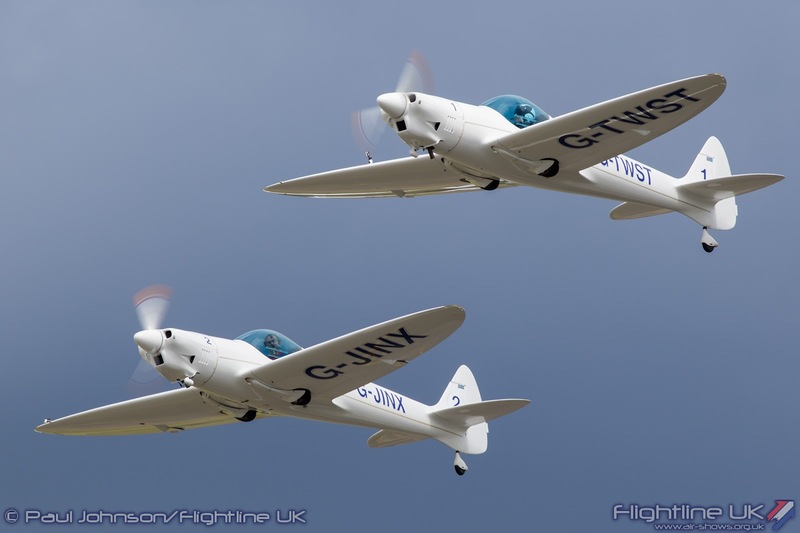 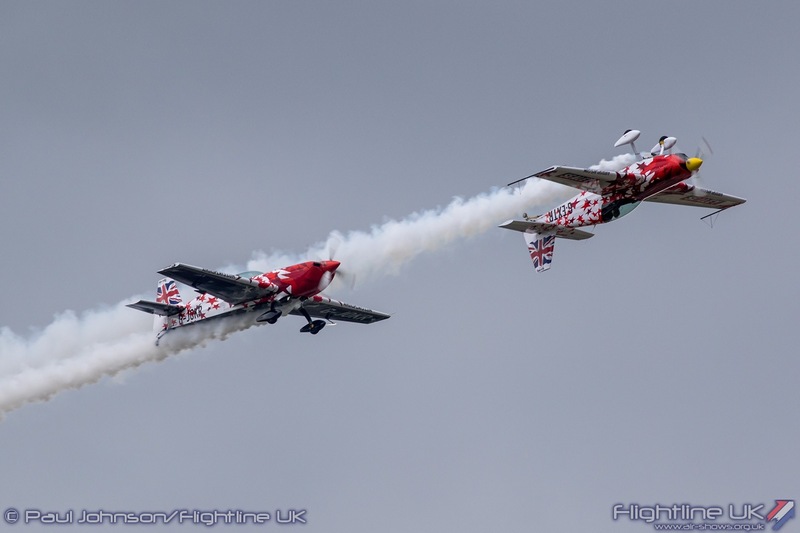 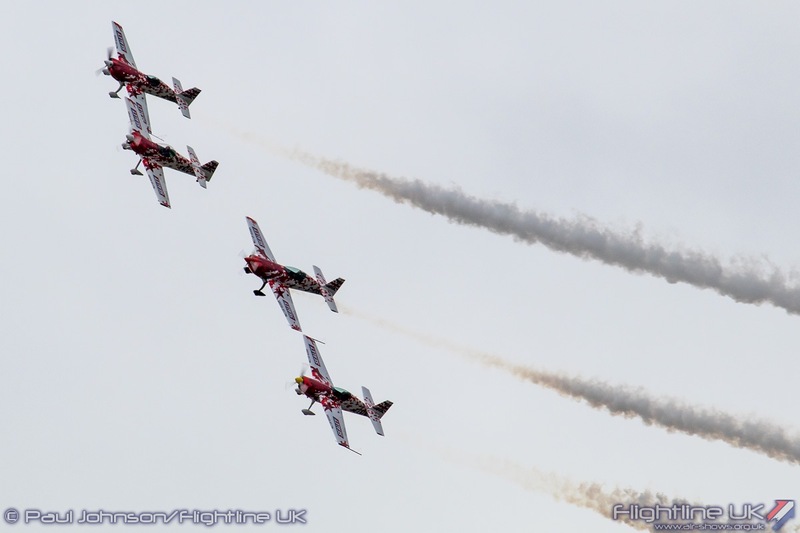 The Twister Aerobatics Team and the Global Stars provided further formation aerobatic thrills. 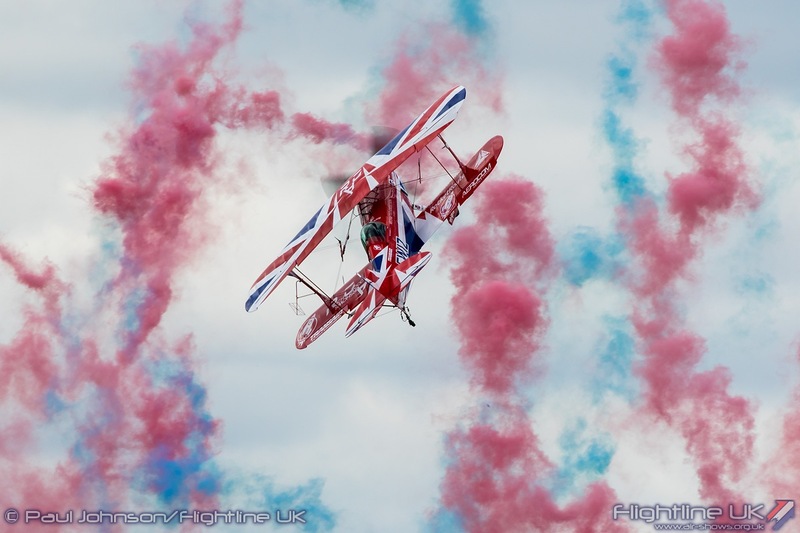 Rich Goodwin’s display in his patriotic Pitts S-2S Special was one of the outstanding highlights of the show. 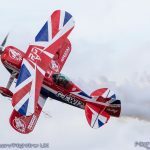 Rich has constantly developed his show over the past few years. 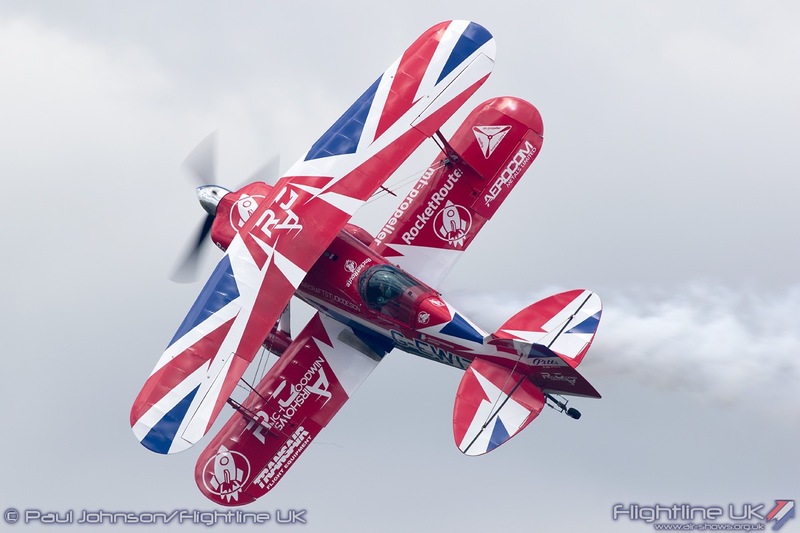 His aircraft has been modified making it one of this most potent aerobatic aircraft on the circuit. 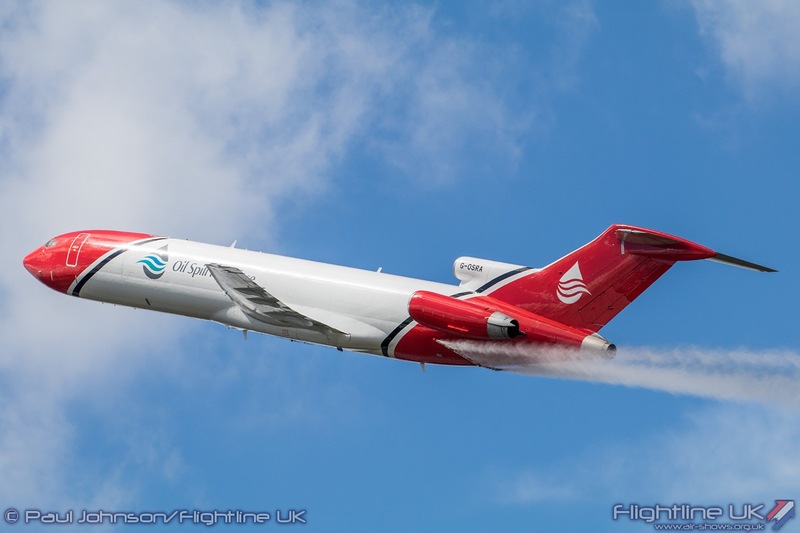 For Farnborough he teamed up with a pyrotechnics team for a really stunning show very like the “Tinstix” displays in the US. 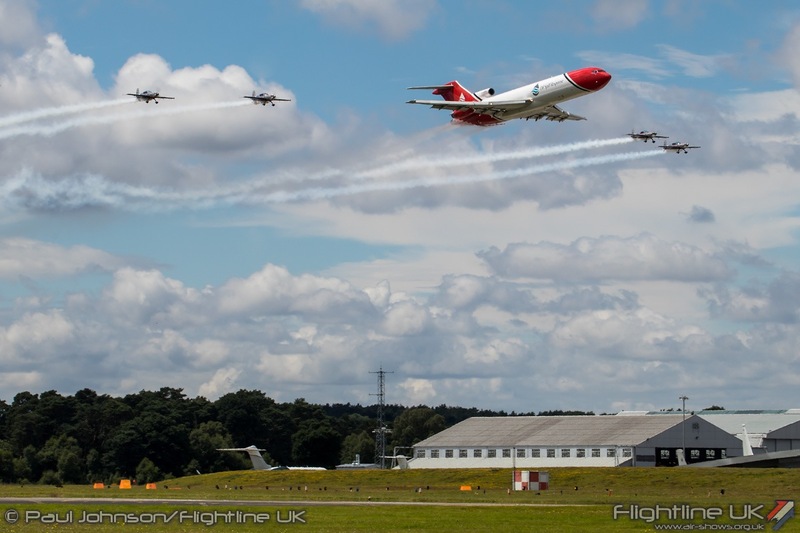 It wasn’t what you’d usually expect from Farnborough at all but the crowd absolutely loved it! 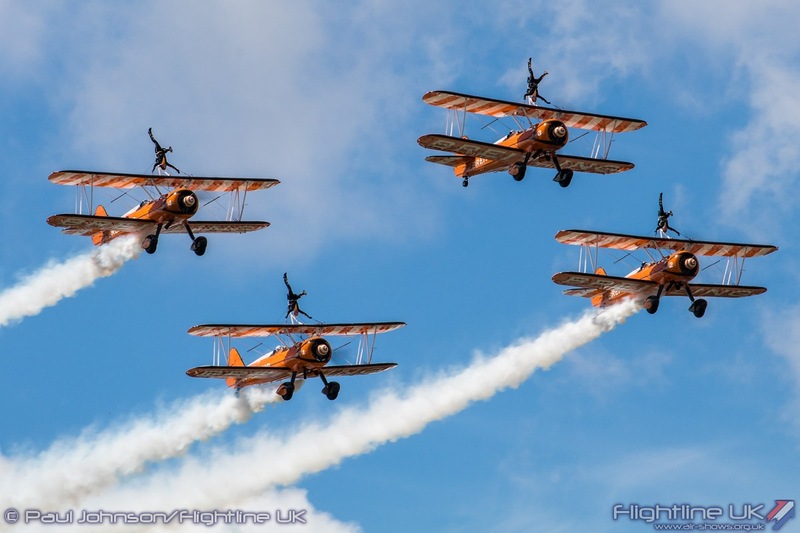 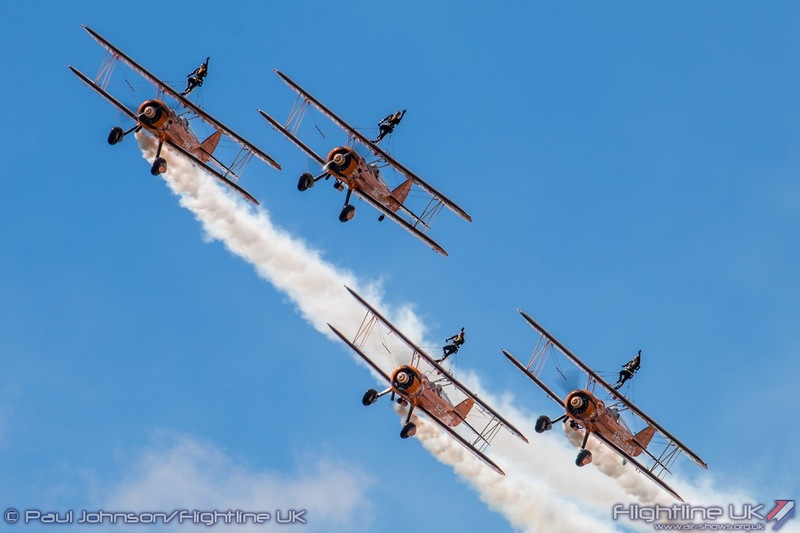 Unique to Farnborough in 2016 was a full four-ship routine from the Breitling Wingwalkers. 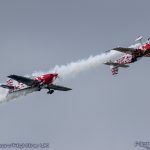 The team are very popular on the European display circuit during the summer so very often the team is split into two pairs. 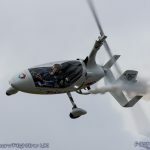 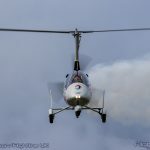 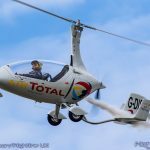 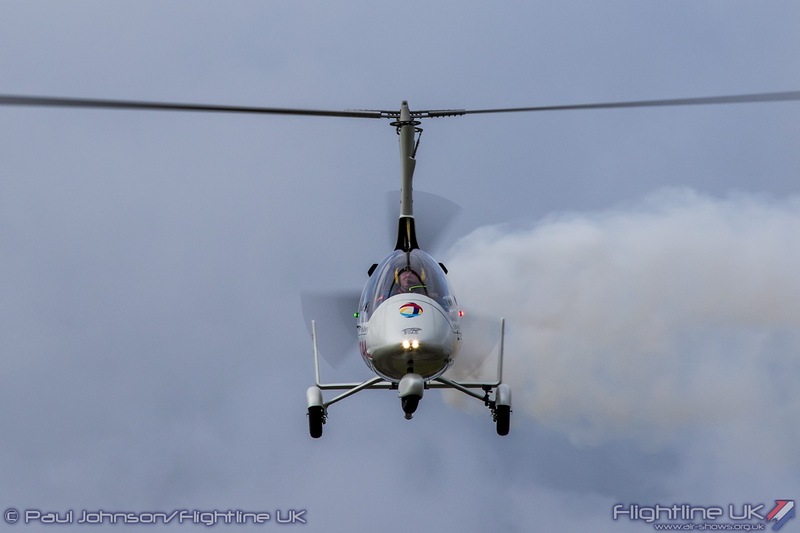 Another routine that the crowd really got into was the Calidus Autogyro flown by Peter Davies. 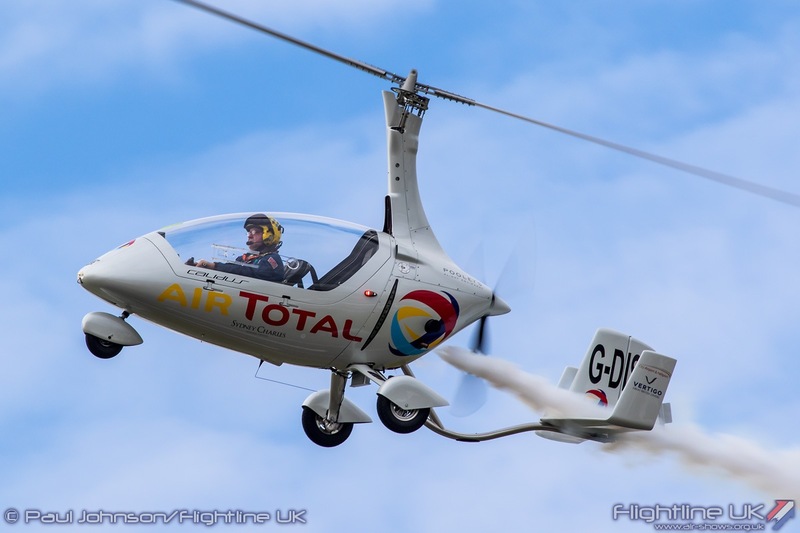 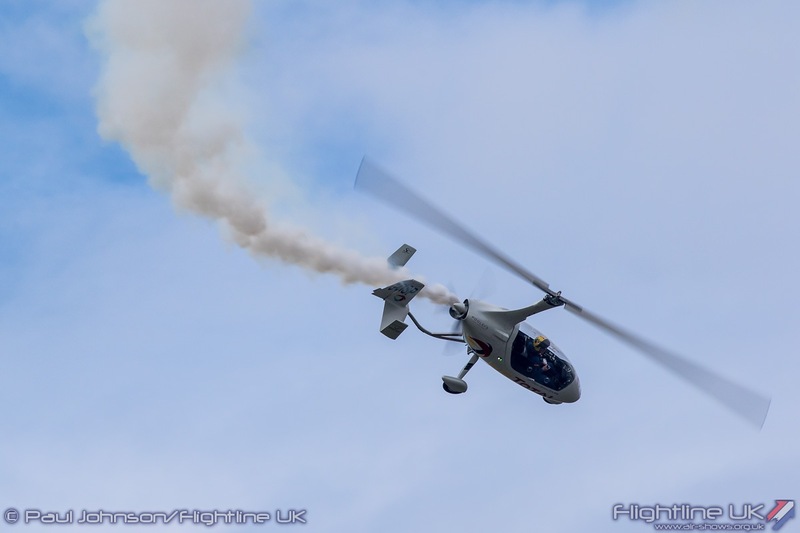 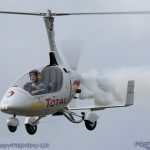 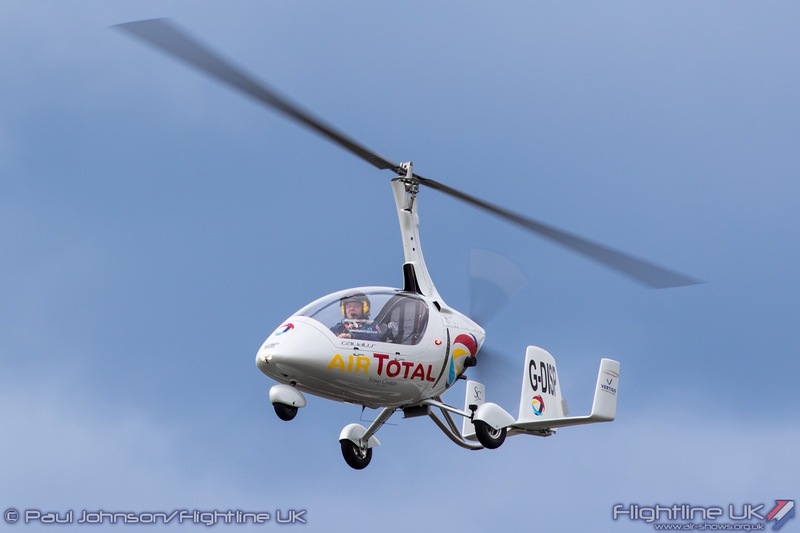 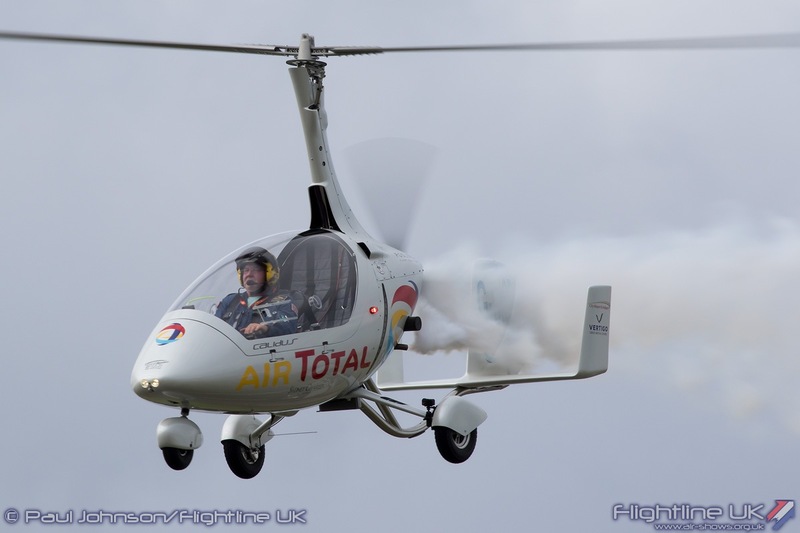 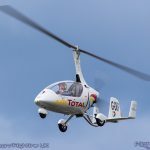 It was the first time in 43 years than a gyrocopter had flown at Farnborough Airshow. 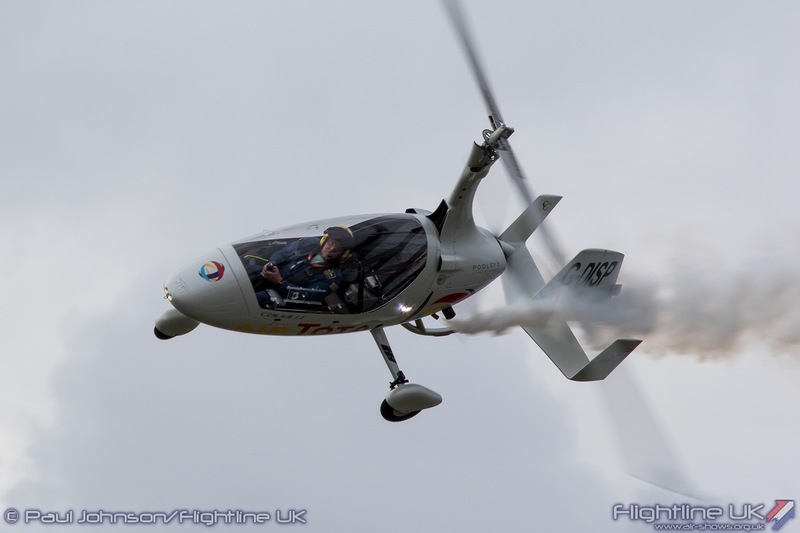 Peter was displaying his new Calidus, G-DISP, which wears a very smart silver colour scheme. 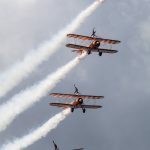 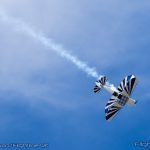 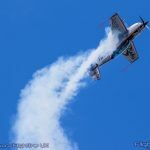 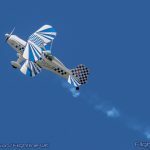 Peter is one of a few acts to have recently received dispensation to fly closer to the crowd which means they get a superb view of his very dramatic display routine. 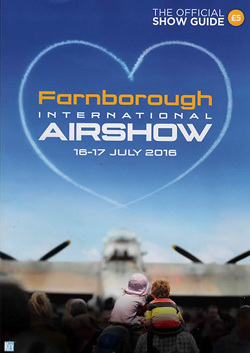 Farnborough is not cheap for adults with on the day ticket prices close to £50 (Children up to 15 years old are free) but it remains a very busy with very large crowds that fill the entire showground. 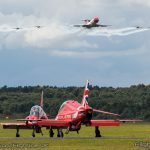 Farnborough’s famous name and its strong transport links to London will always mean it will remain popular. 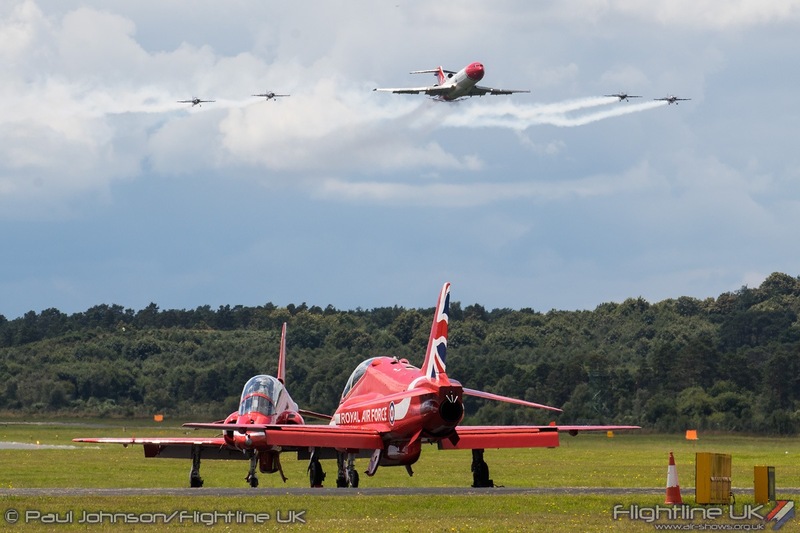 However, the Farnborough organisers do put together a very full family day out. 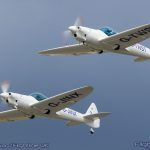 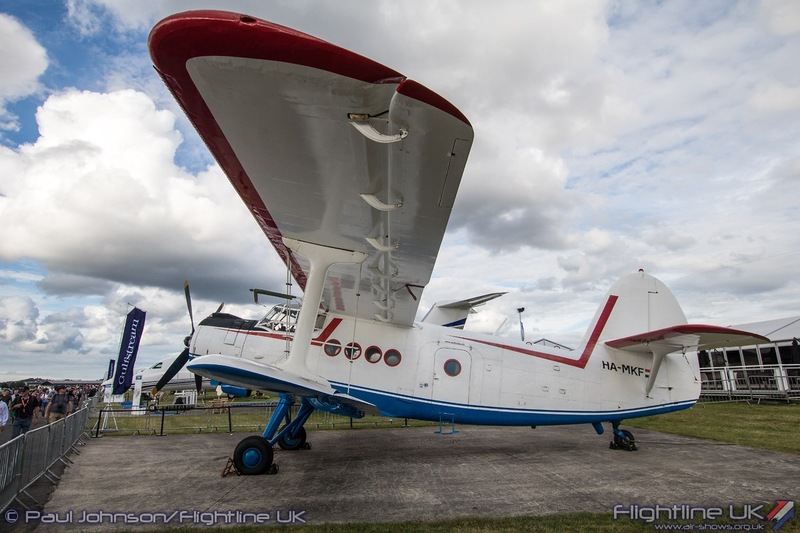 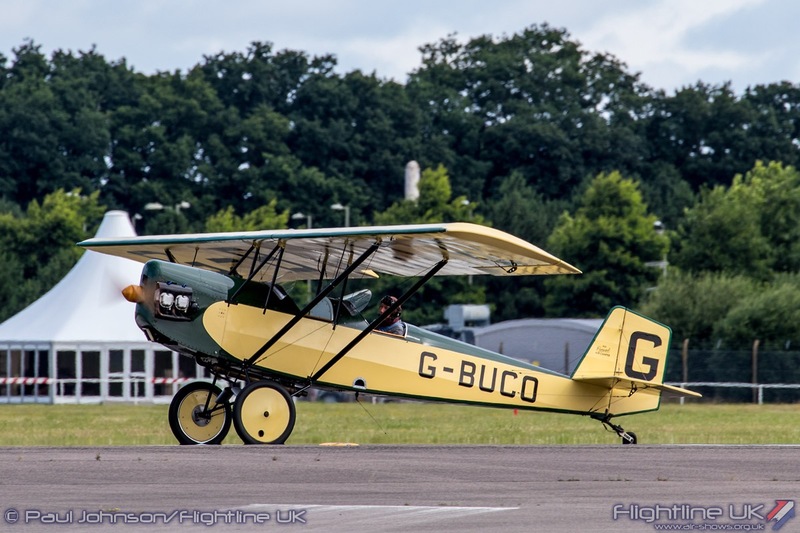 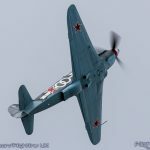 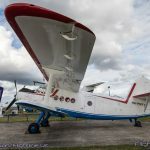 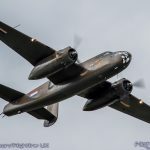 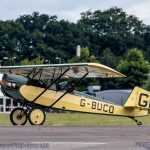 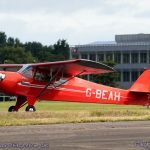 There are plenty of ground exhibitions from the likes of UK Space, Boeing and Brooklands Museum plus the Airshow Live Stage which ran in the lead-up to the flying displays. 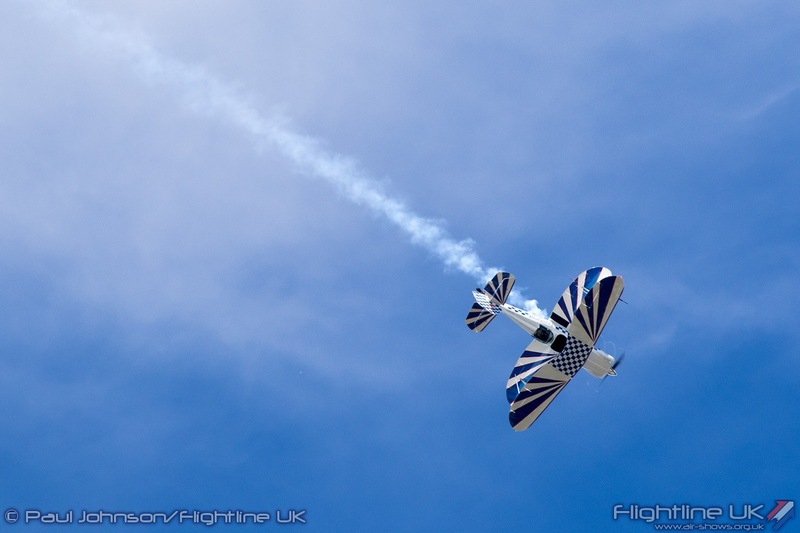 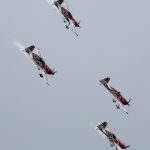 The content and style of those flying displays may well have been lead far more by tighter regulations this year, but like the rest of the show it was a very full programme. 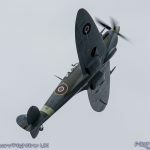 The regular highlights such as the A380, F/A-18F and Typhoon were joined by a varied collection of displays. 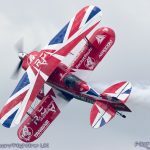 Most memorable were the likes of Rich Goodwin’s displays with pyrotechnics, the Calidus Autogyro, the Royal Air Force flypasts featuring the Red Arrows and A400M, the Army Air Corps Apache and of course the F-35B Lightning II. 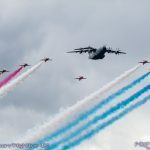 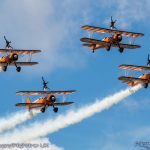 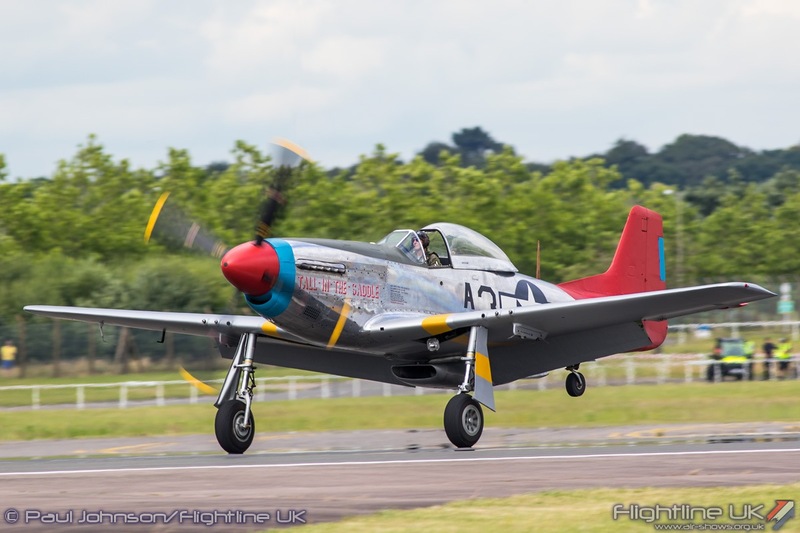 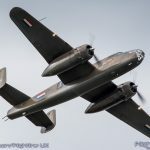 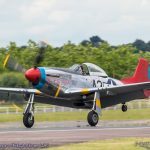 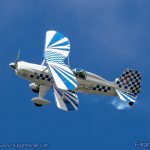 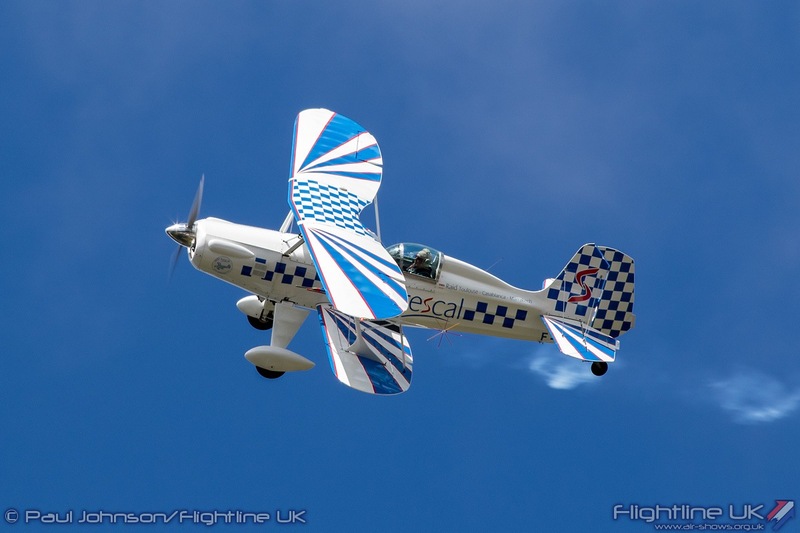 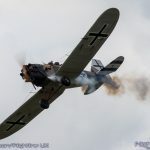 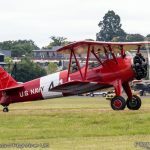 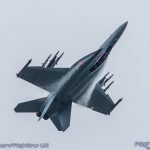 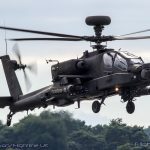 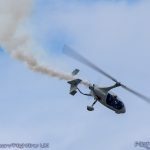 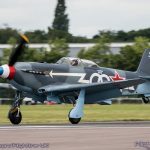 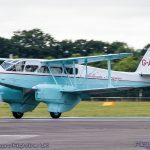 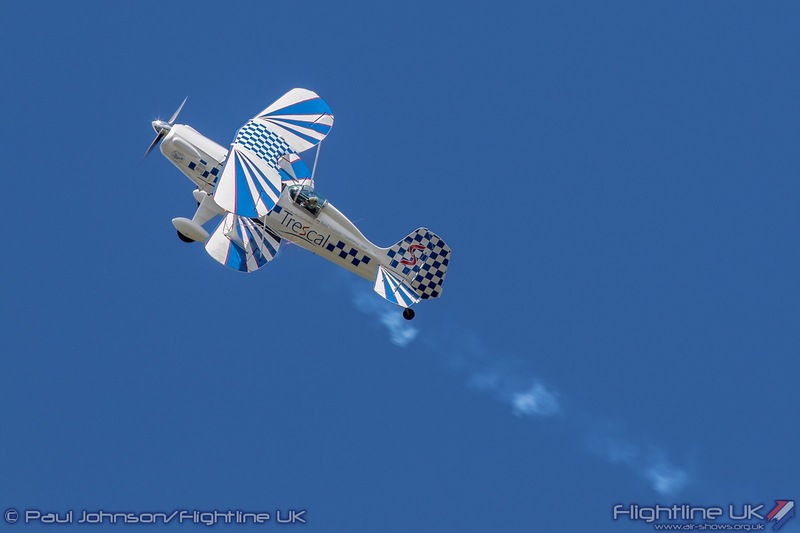 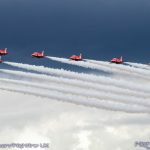 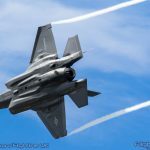 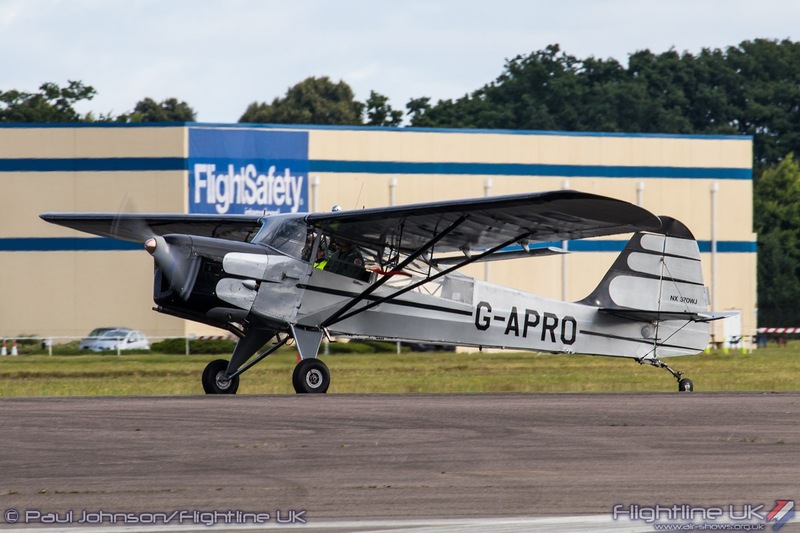 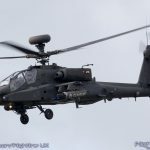 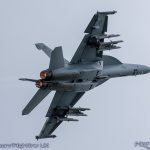 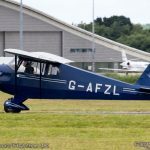 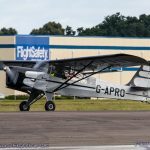 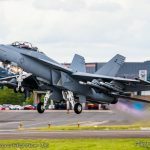 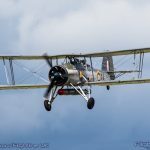 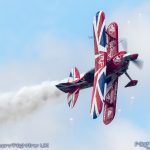 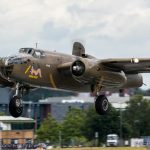 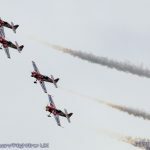 While off the back of the Royal International Air Tattoo it may have lacked appeal to some enthusiasts, the flying display was entertaining for the wider audience, particularly when coupled to the commentary from Stratton Richey and his team. 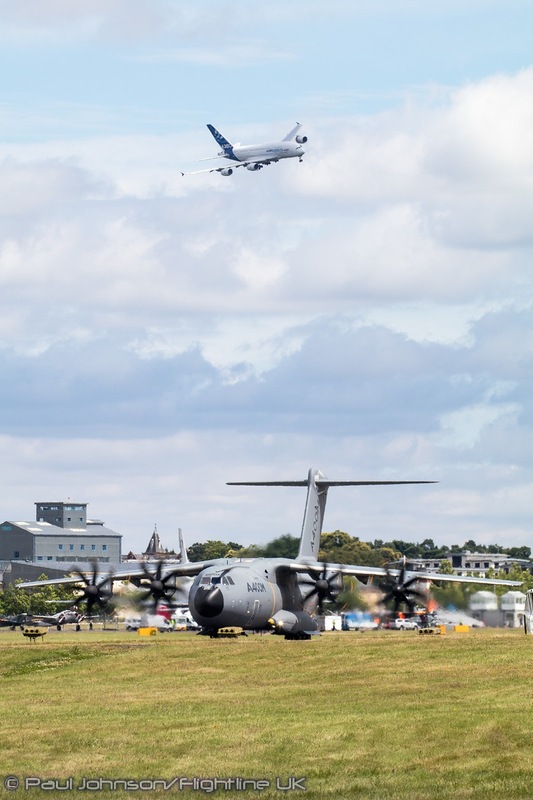 We hope the public weekends at Farnborough continue for many years to come – they are a very important part of the UK airshow scene.